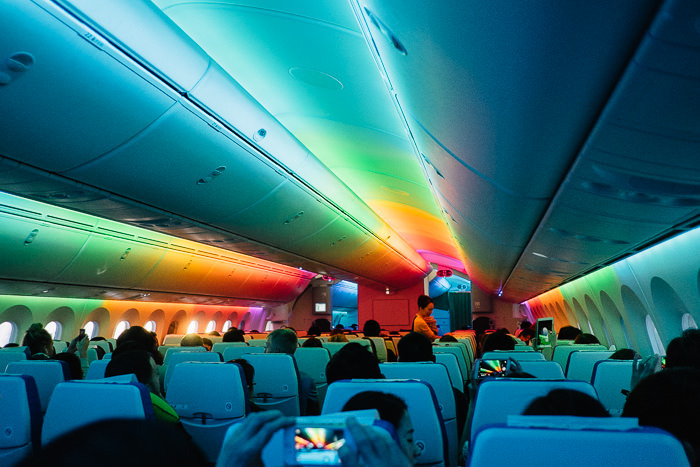 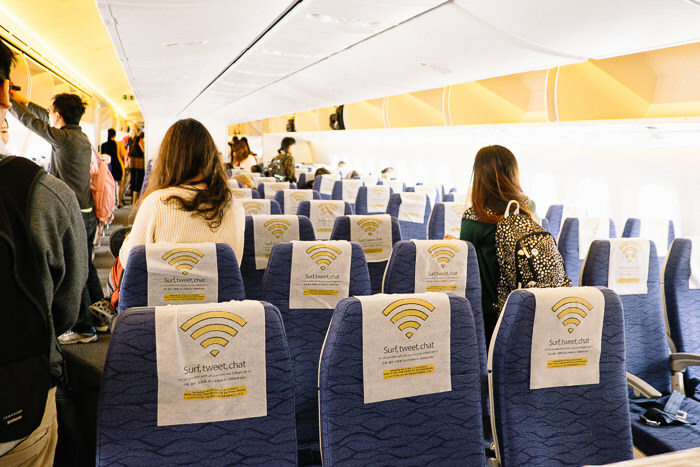 Dimmable windows – instead of sliding down the window covers, you can now ‘dim’ them with the press of a button, almost like instant tinting! 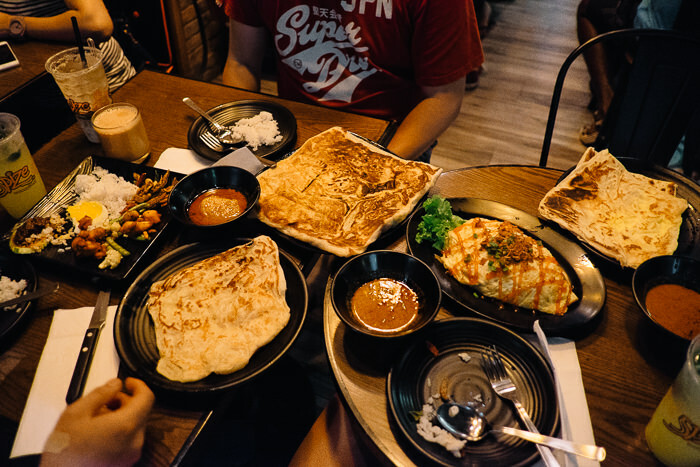 Being greeted by our Singaporean friend, foodie and the-guy-who-plans-to-fatten-us-up-every-trip, Nick he took us to have something we’ve been craving for a while… prata! 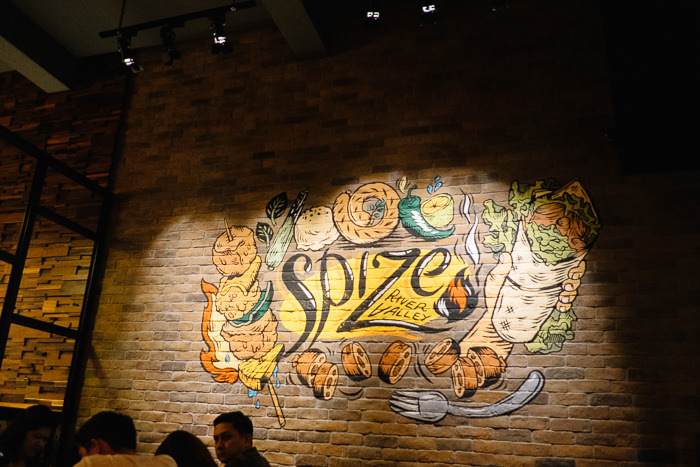 It was our first visit to Spize, which is a little more fancier than the other prata places we’ve been to. 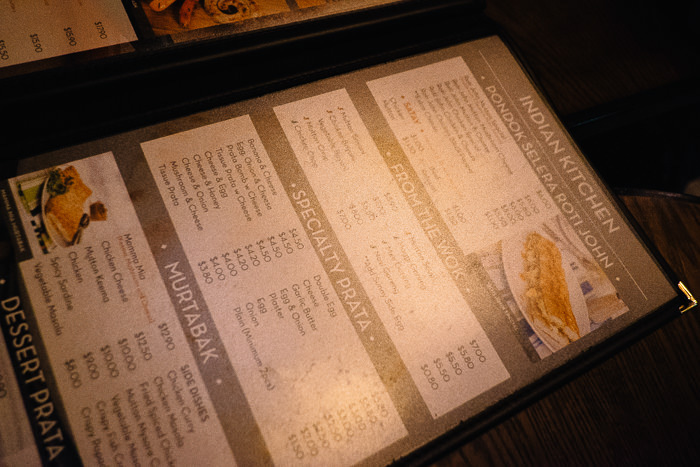 The menu was fairly overwhelming, so many mouthwatering choices! 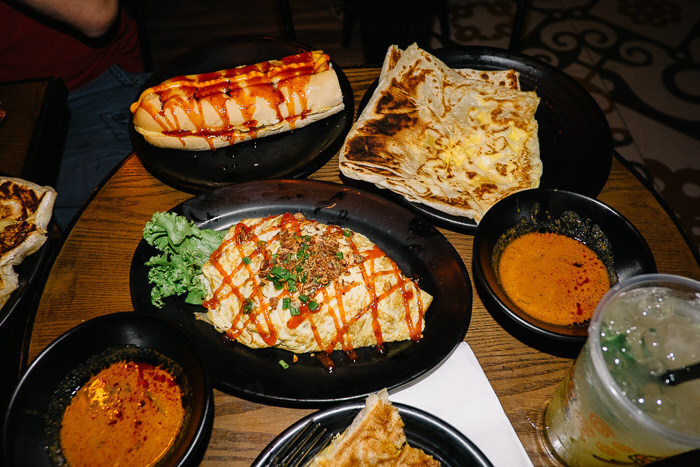 Eventually we made up our minds and as a result of said menu, we ended up ordering too much for 3. 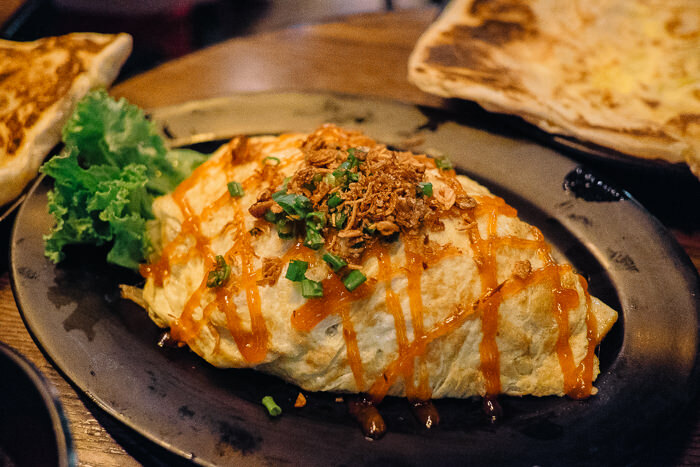 The nasi goreng which was dressed like omurice! 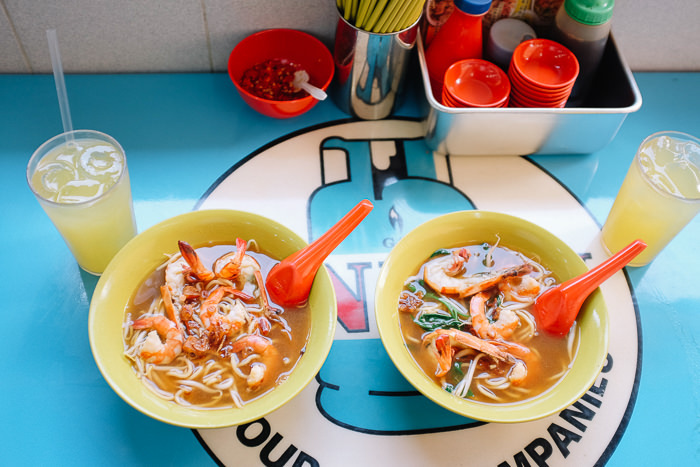 I’m so jealous of how spoilt for choices Singaporeans are when it comes to food, you can have laksa for breakfast if you’re craving it (what a crazy diet though?!). 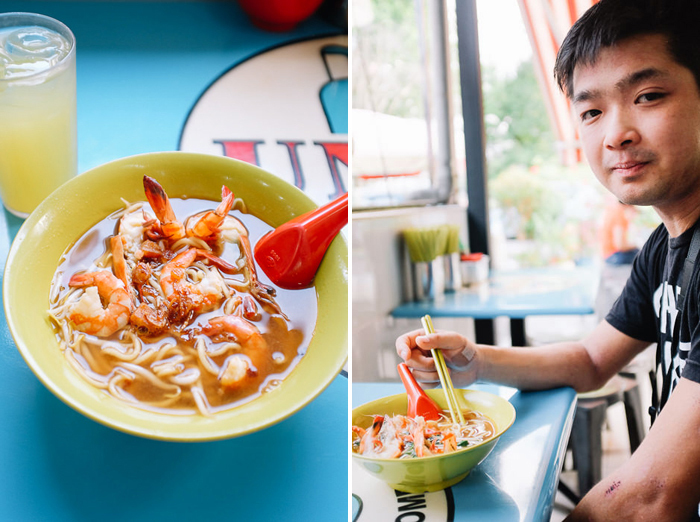 We decided to treat our stomaches to prawn noodles for the first meal of our one day in Singapore. 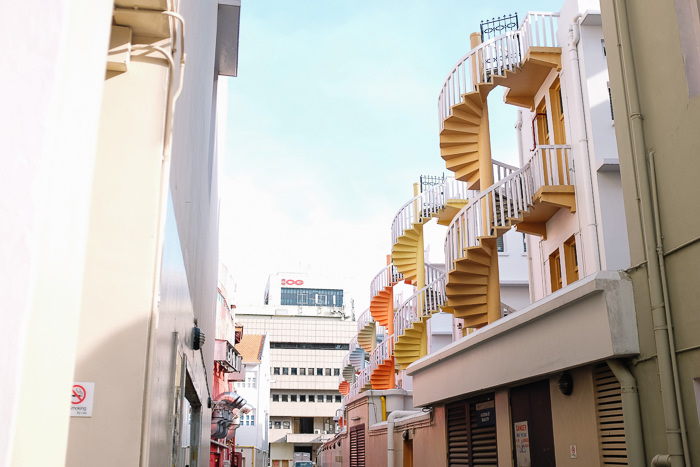 Our friend drove us here on a previous trip, we couldn’t quite tell where we were in relation to other places. 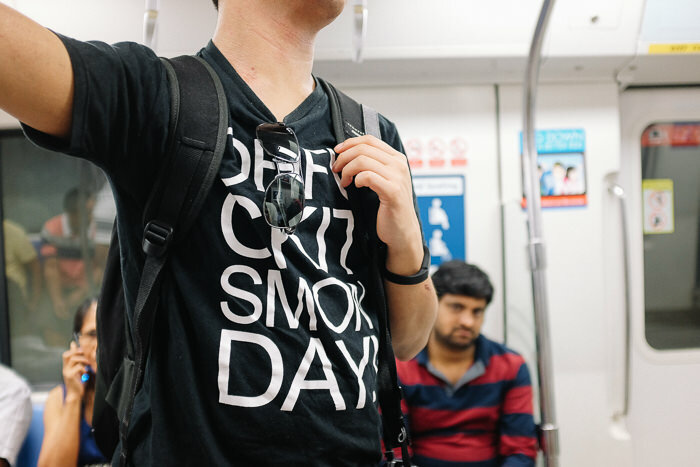 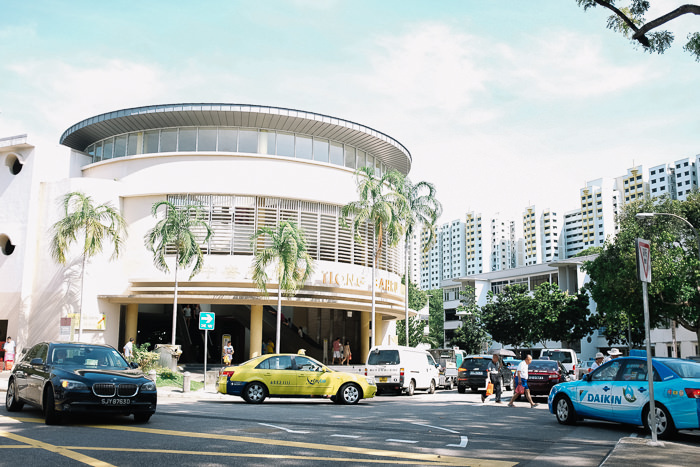 This time we got there ourselves using the MRT and was surprised how convenient it is, it was pretty much across the road from Kallang MRT station! 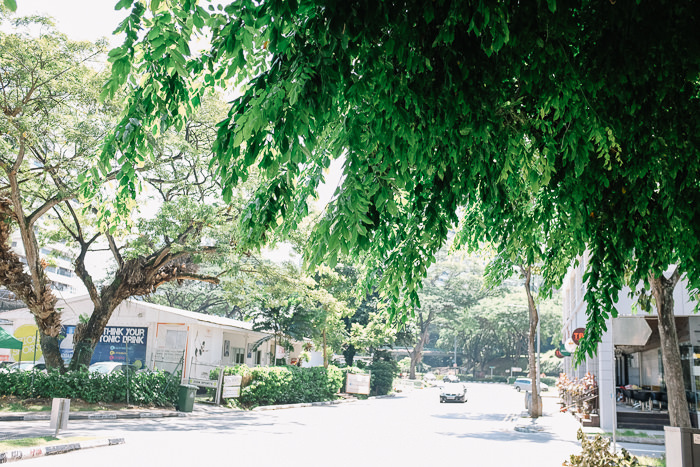 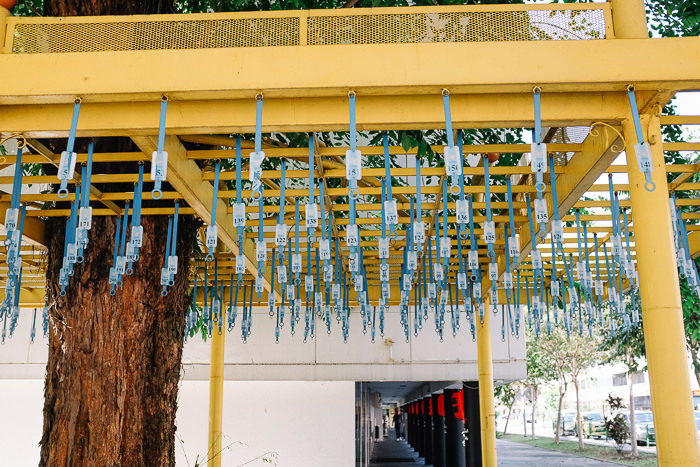 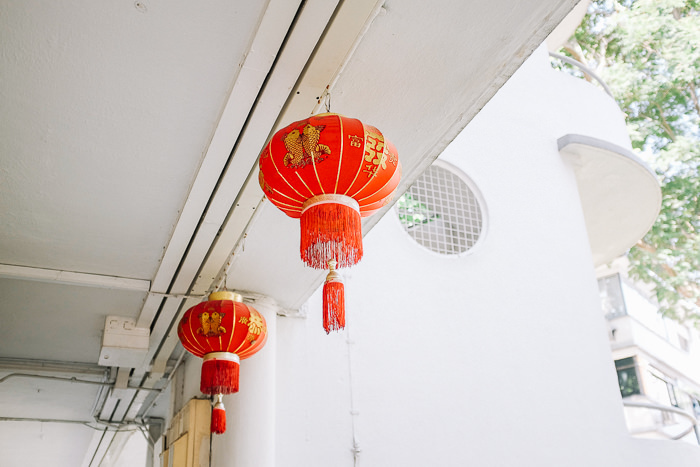 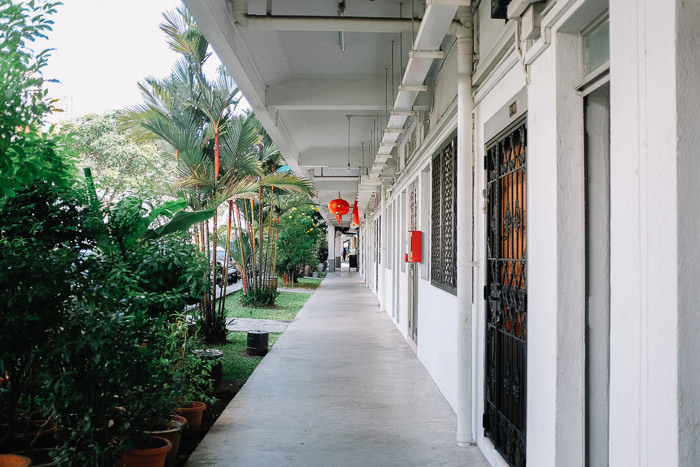 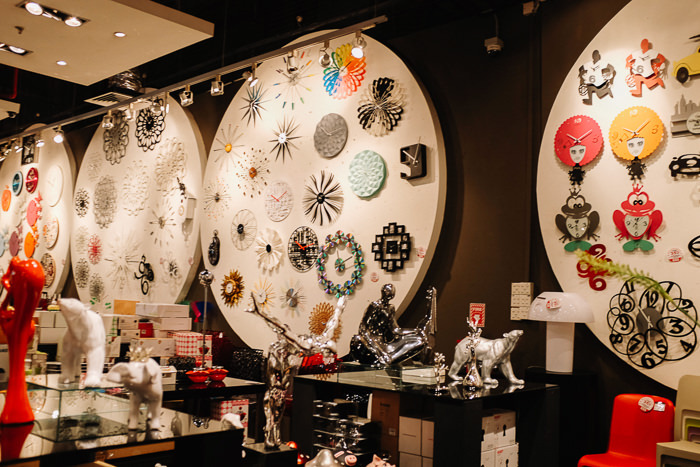 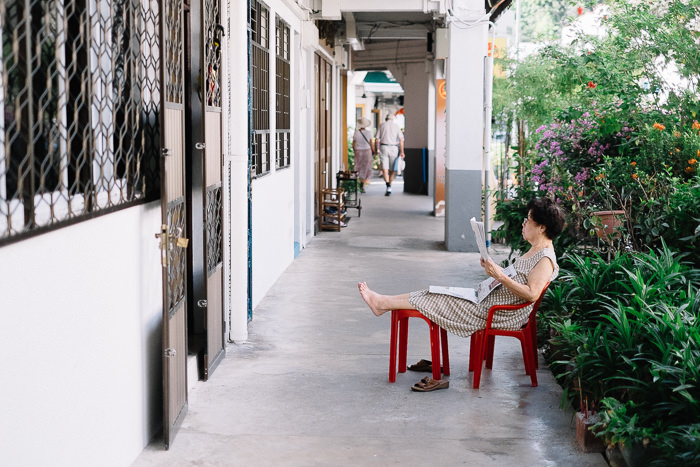 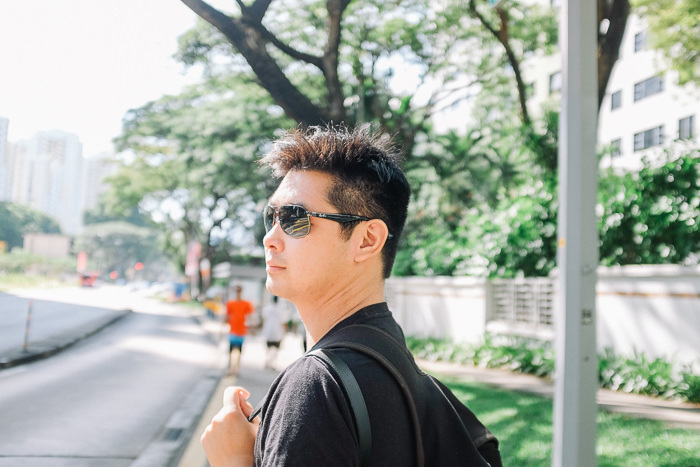 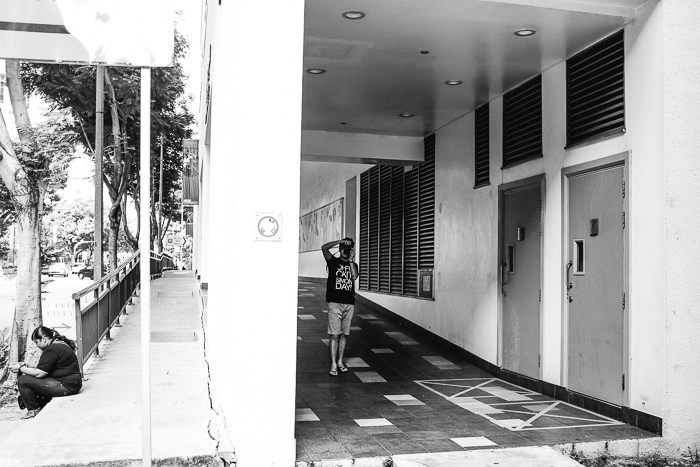 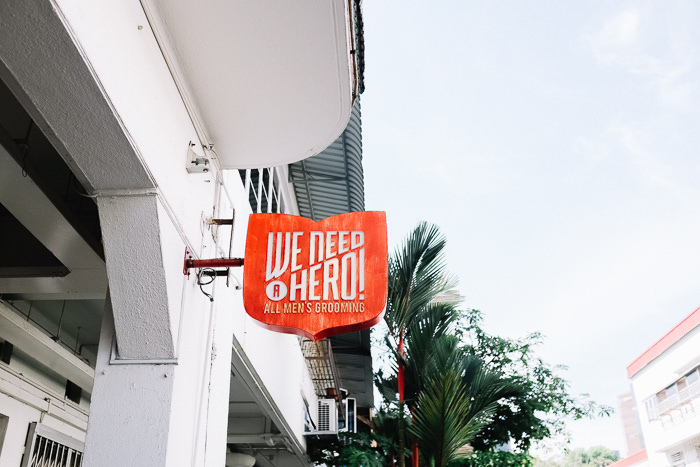 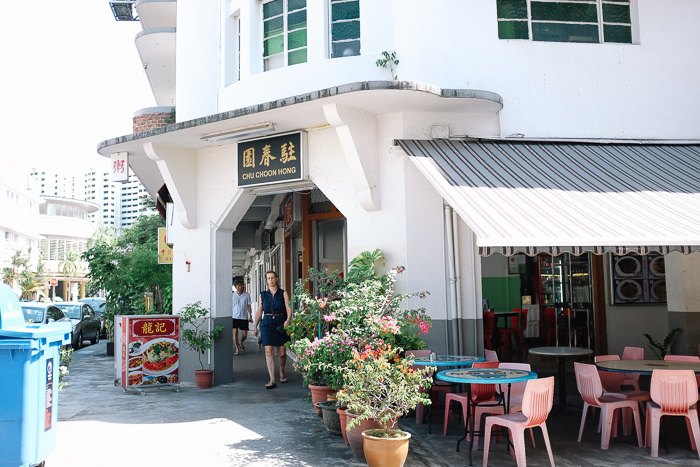 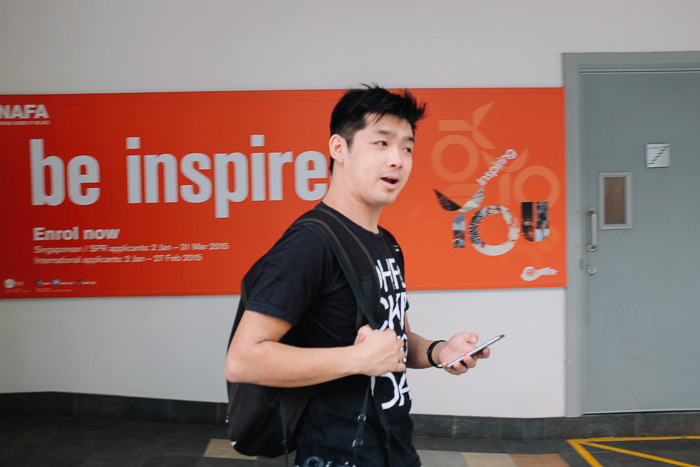 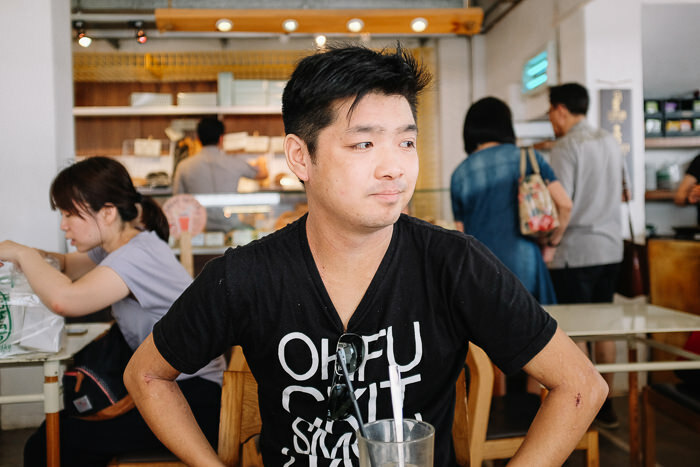 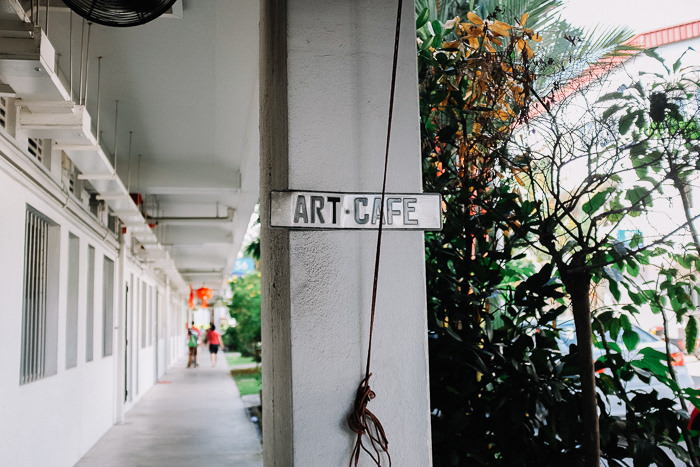 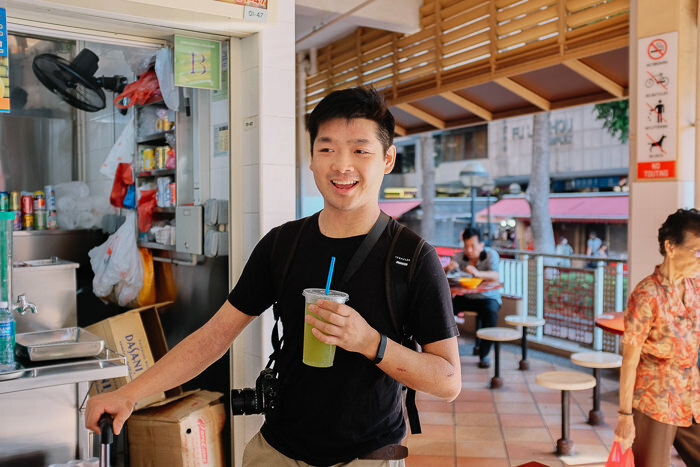 After a quick train ride and a not so short walk from the station, we found ourselves in Tiong Bahru – what was supposed to be the more hipster part of Singapore. 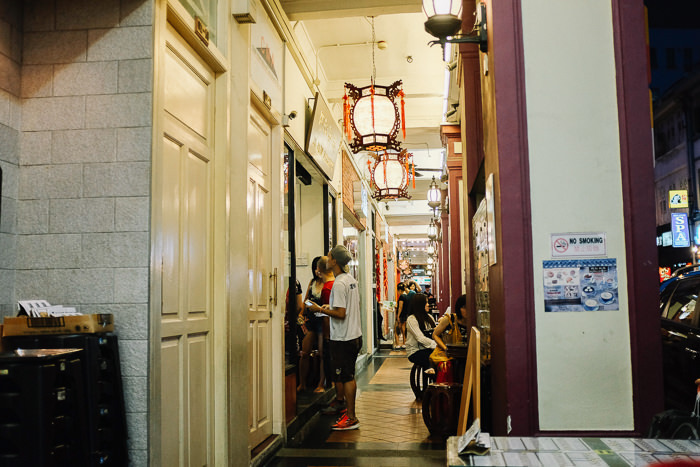 We really weren’t too sure of where to go so just wandered around the streets which were supposedly popular according to our on-the-spot google search. 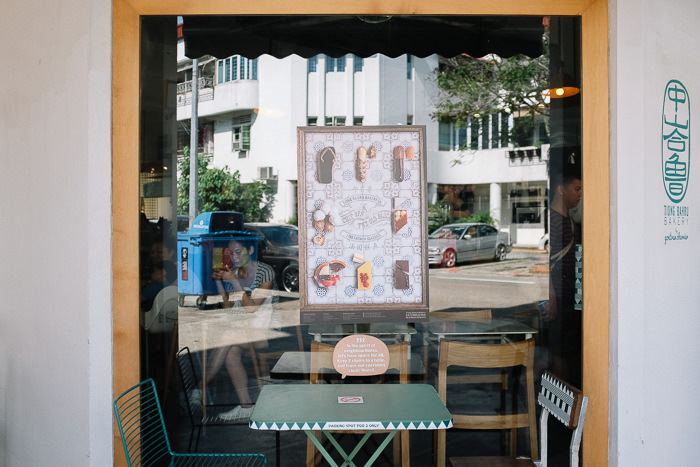 It didn’t take us long before we gave in to the stinking hot weather and resorted to any cafe that had air conditioning. 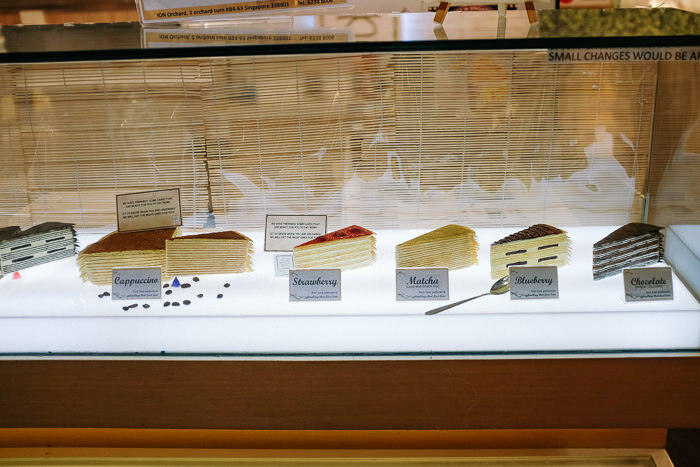 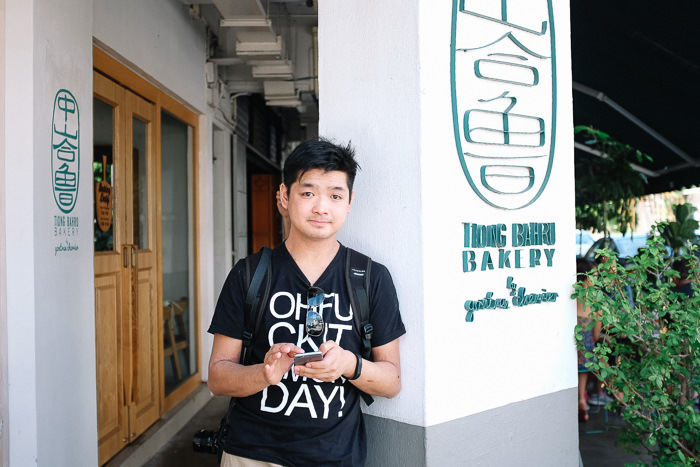 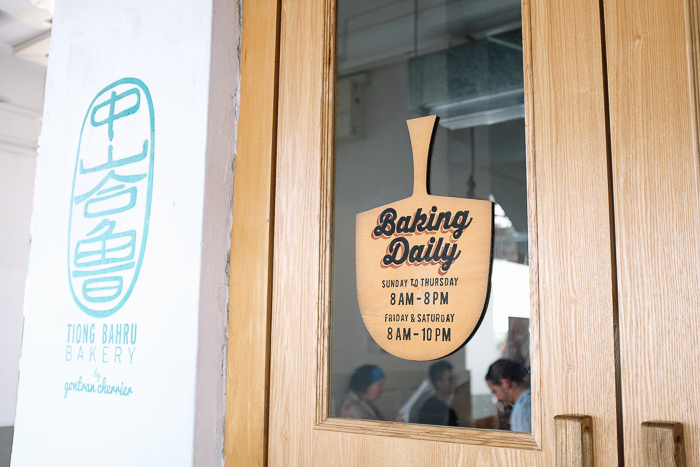 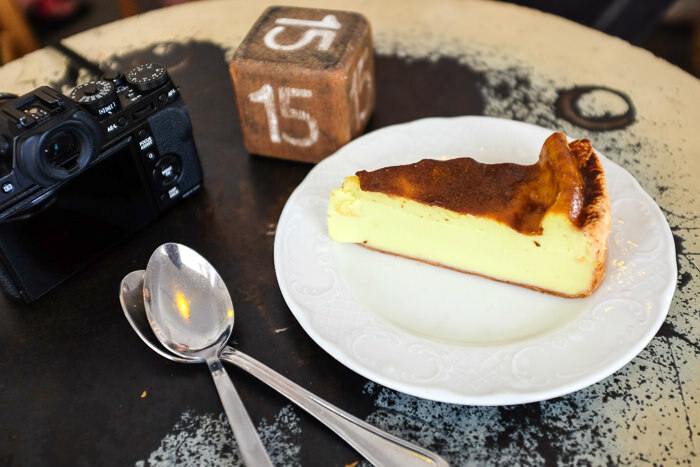 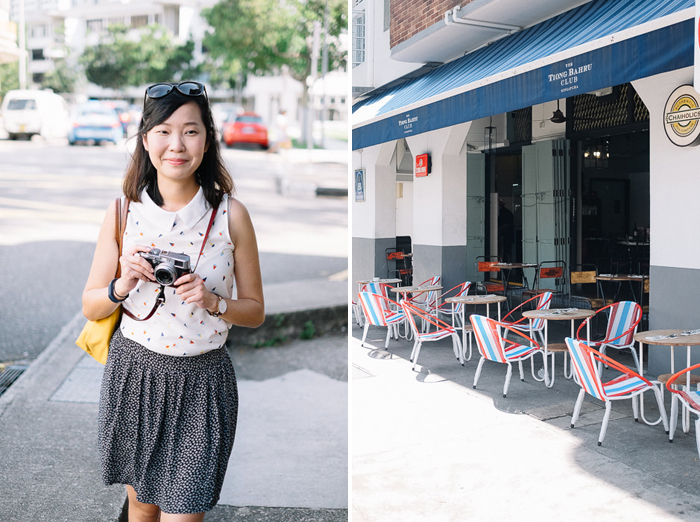 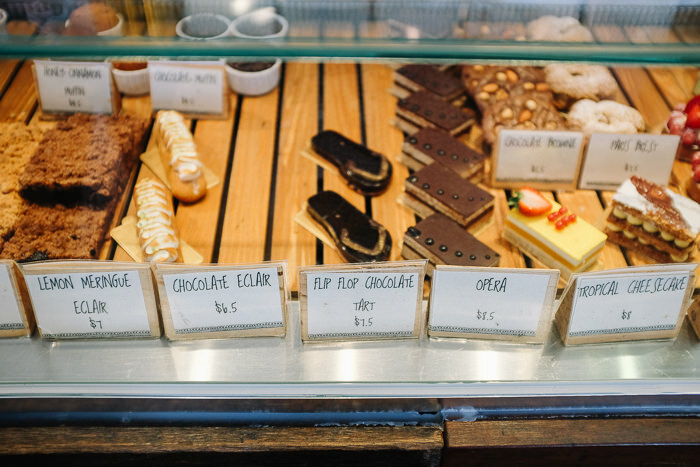 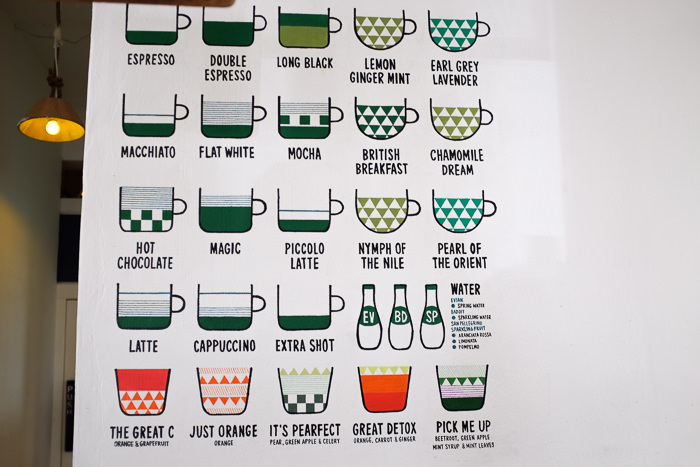 Luckily we were right near Tiong Bahru Bakery – one of our favourite bakeries. 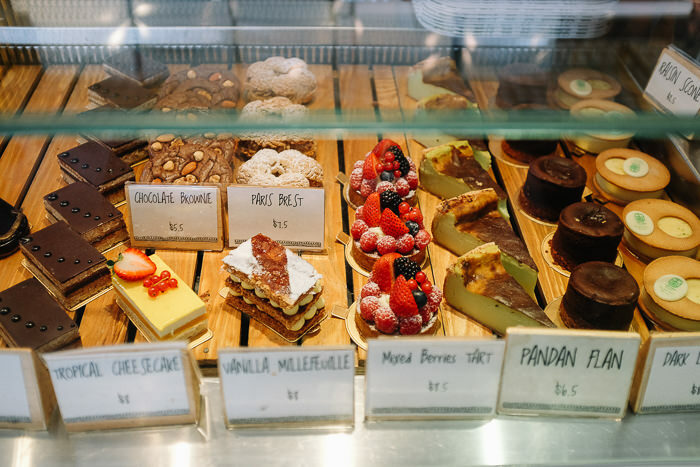 Love their assortment of pastries and cakes, a favourite being the Pandan flan! 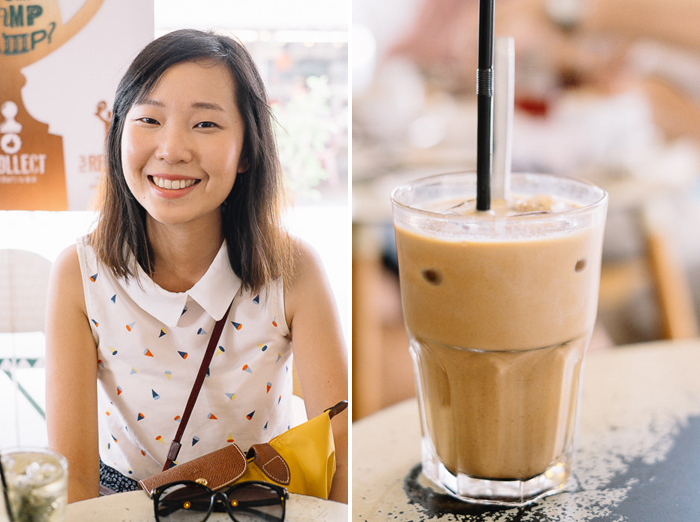 Ice coffee for the mister! 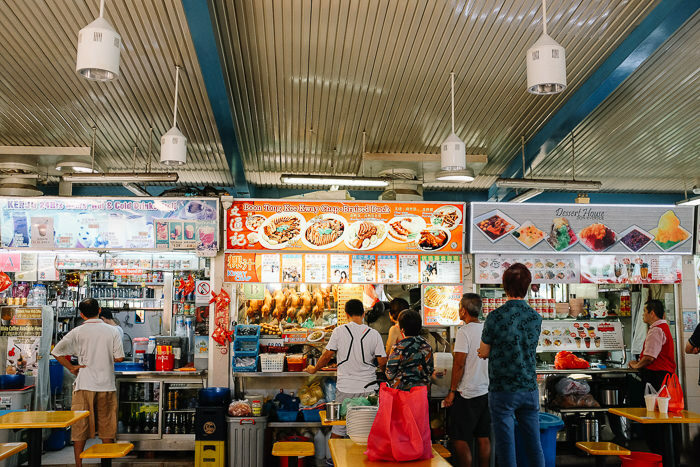 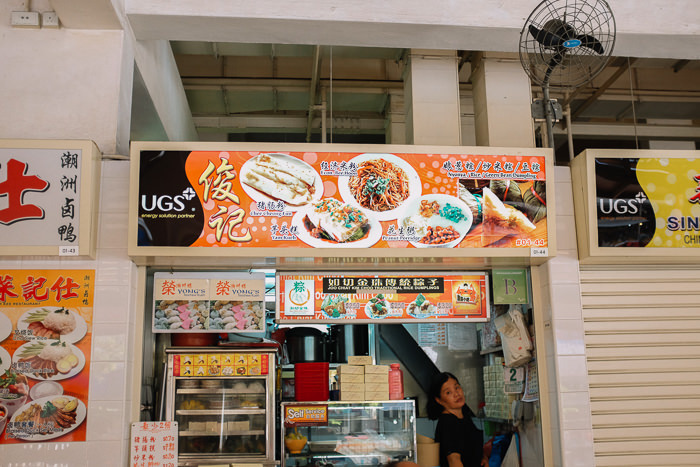 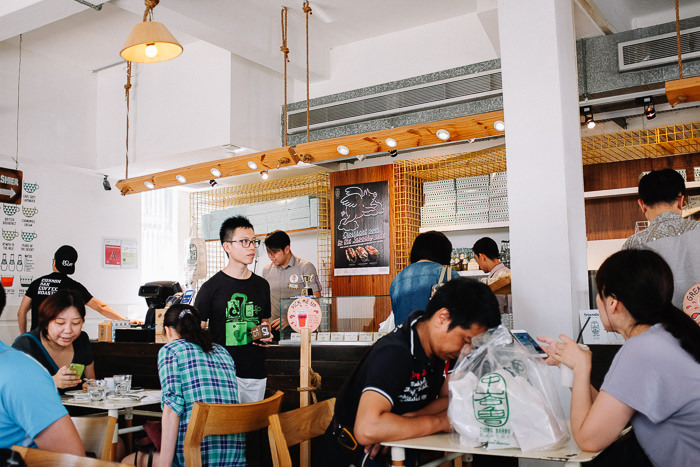 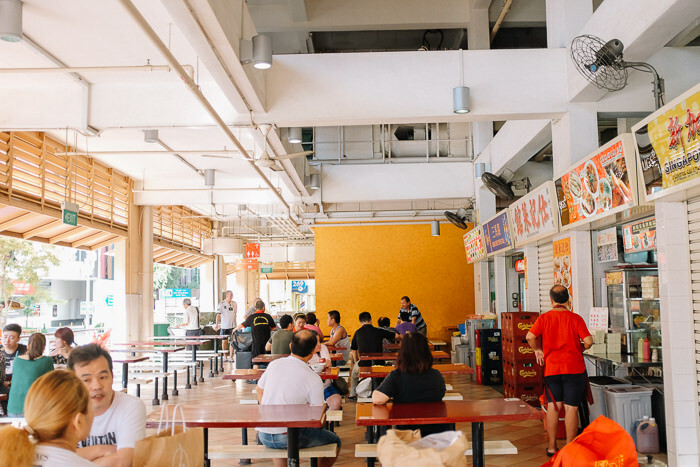 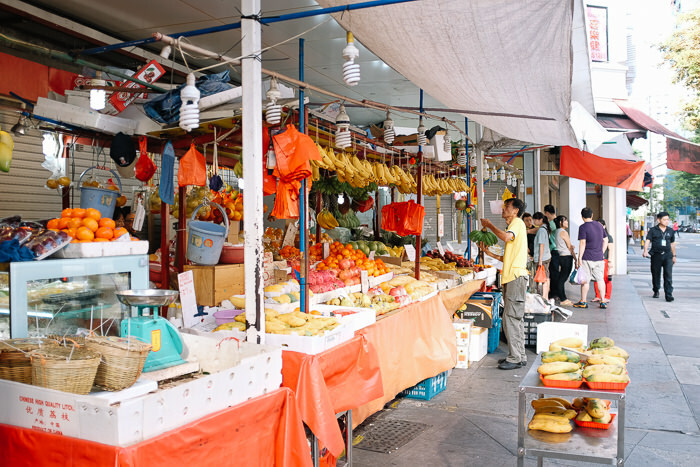 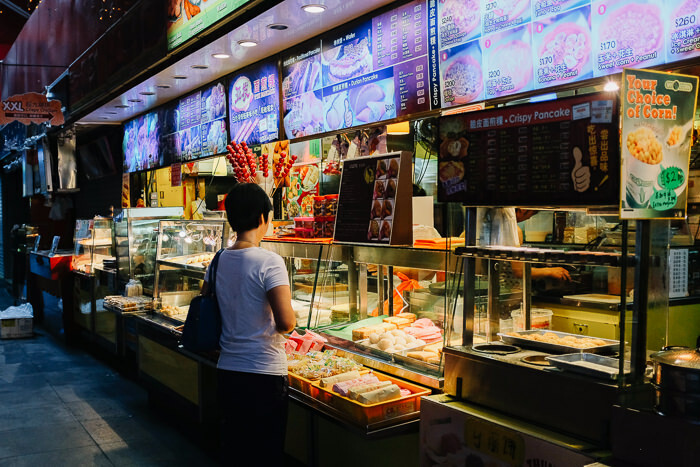 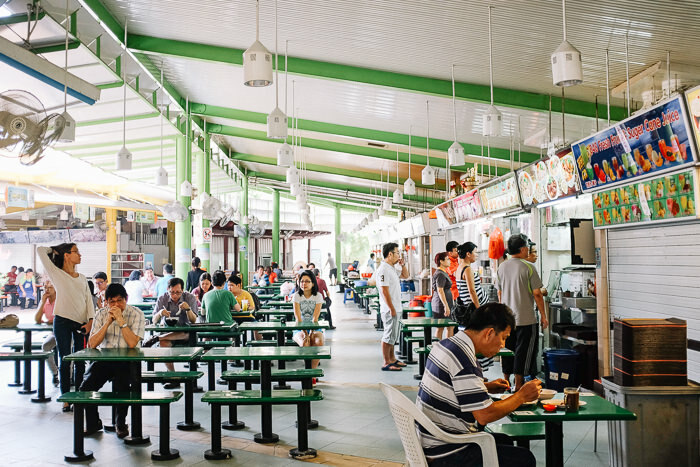 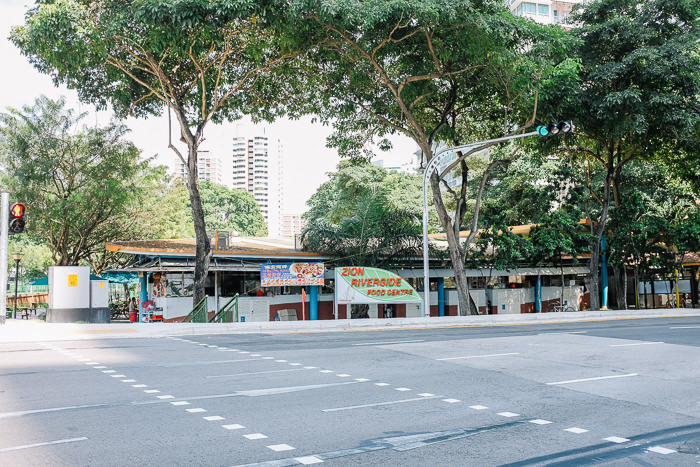 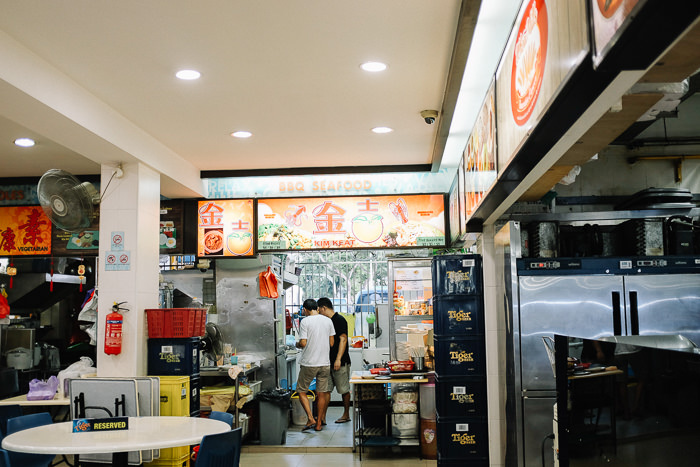 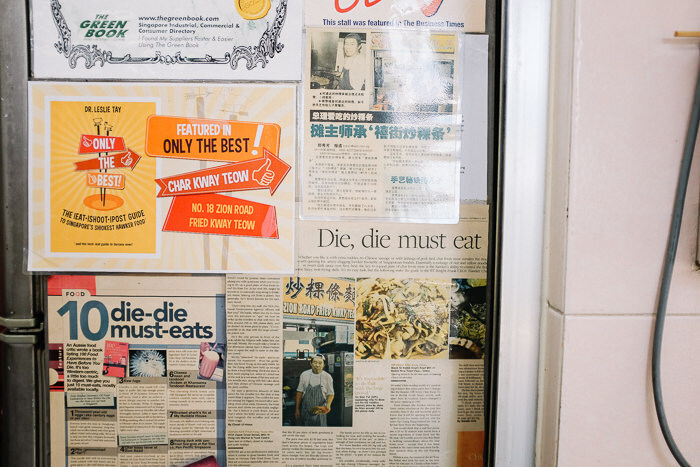 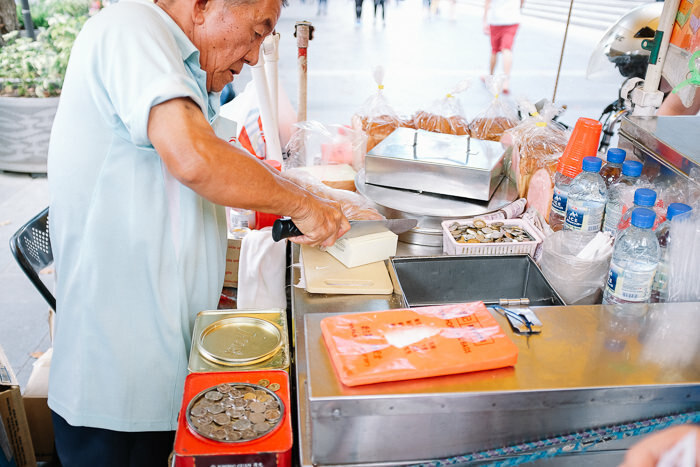 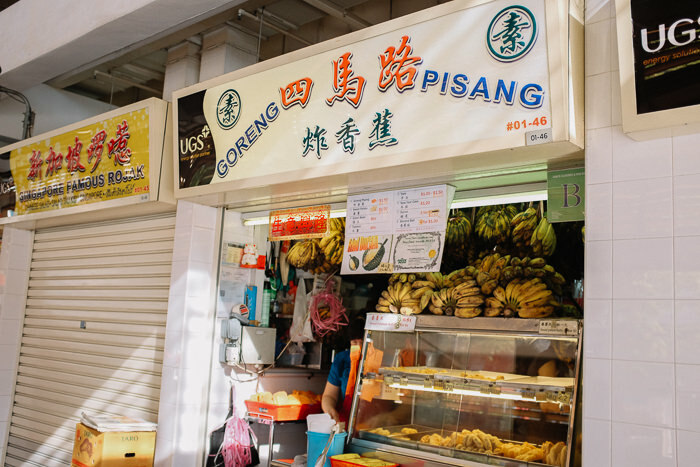 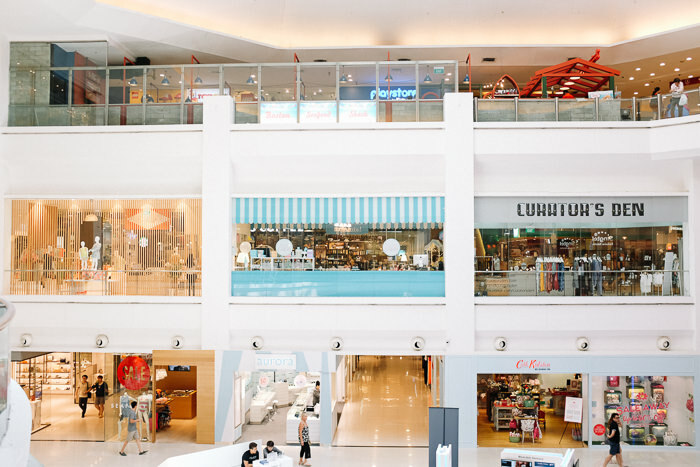 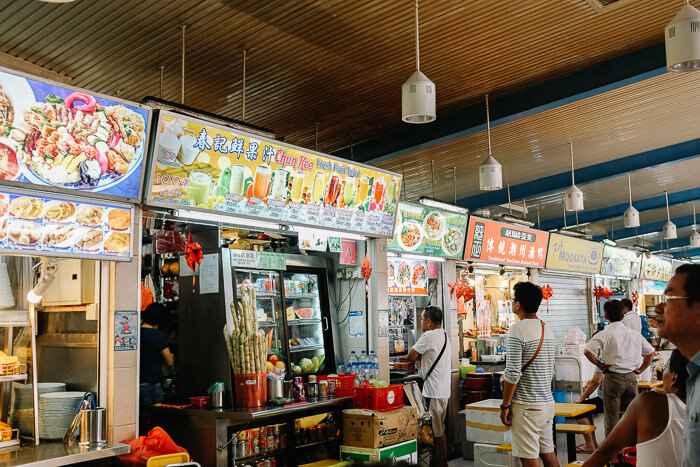 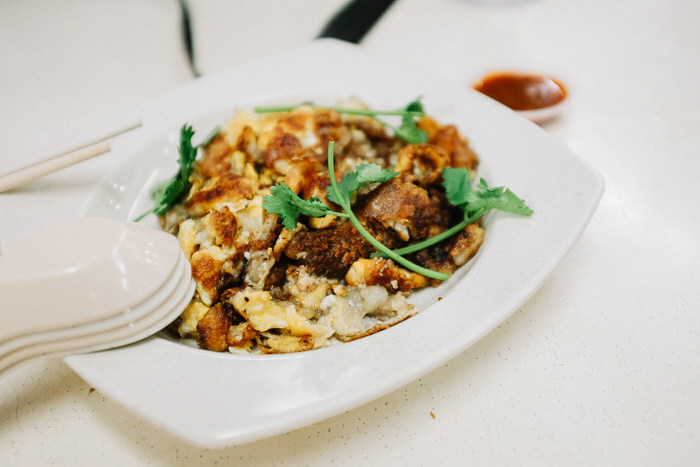 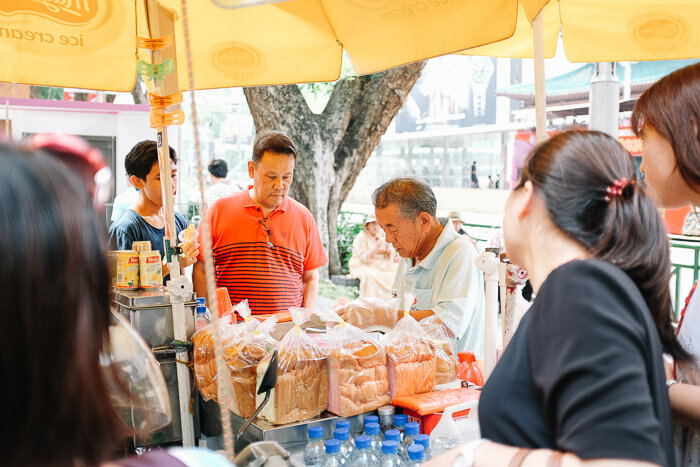 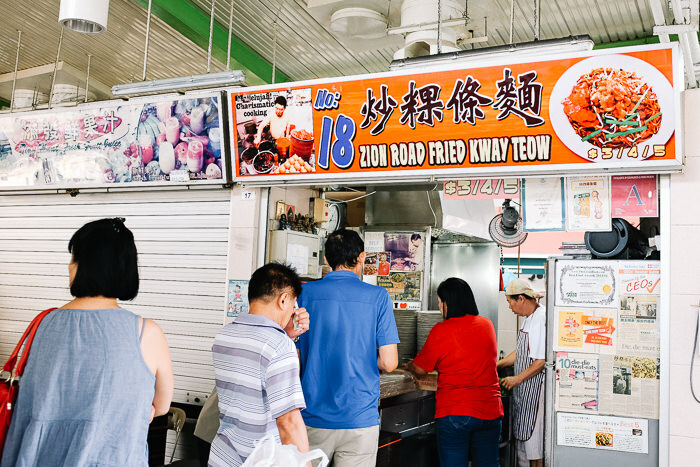 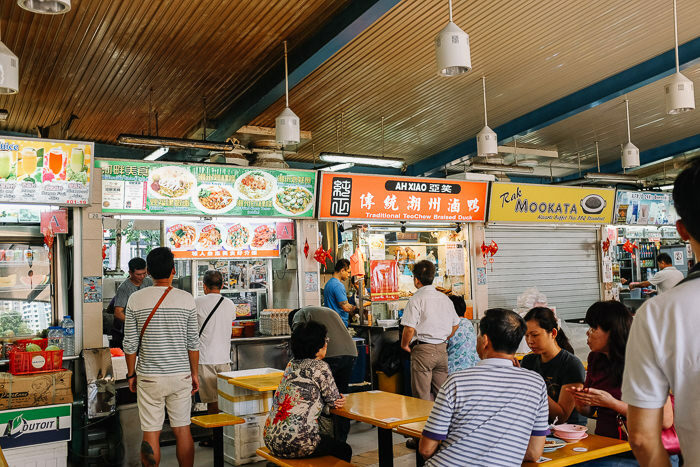 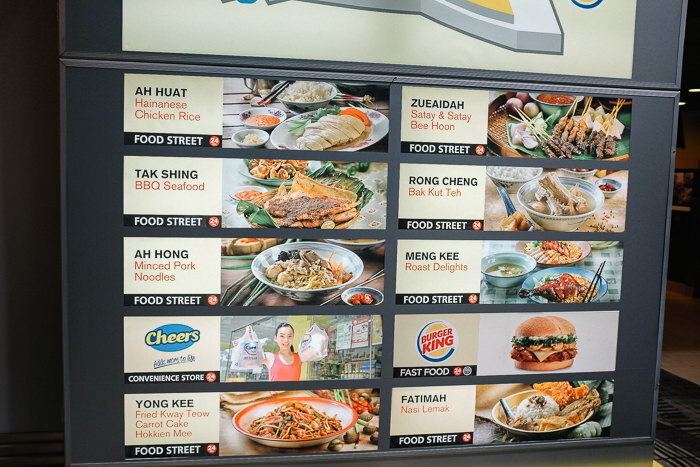 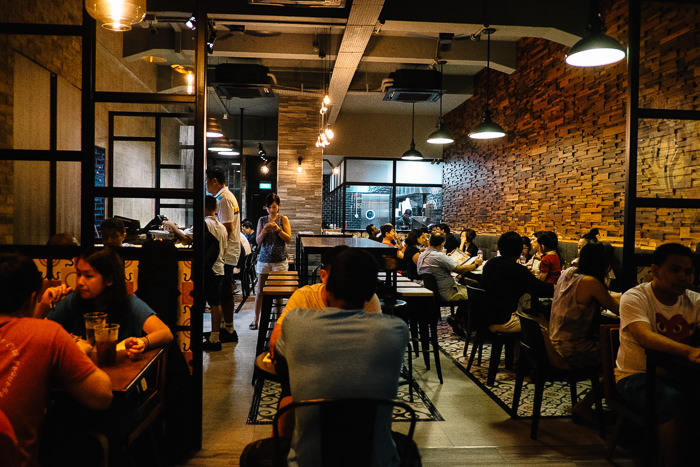 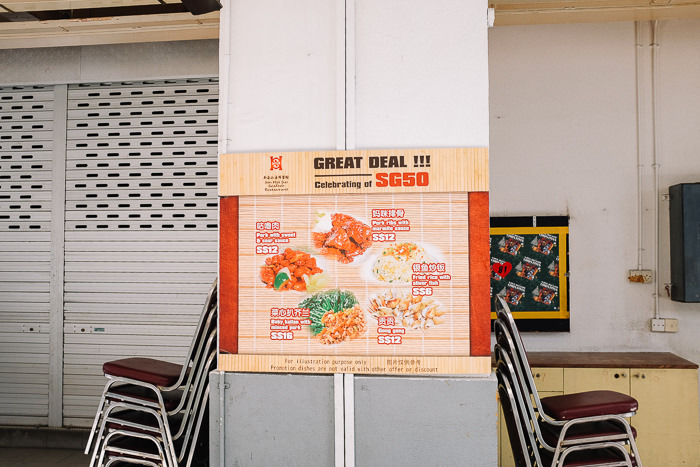 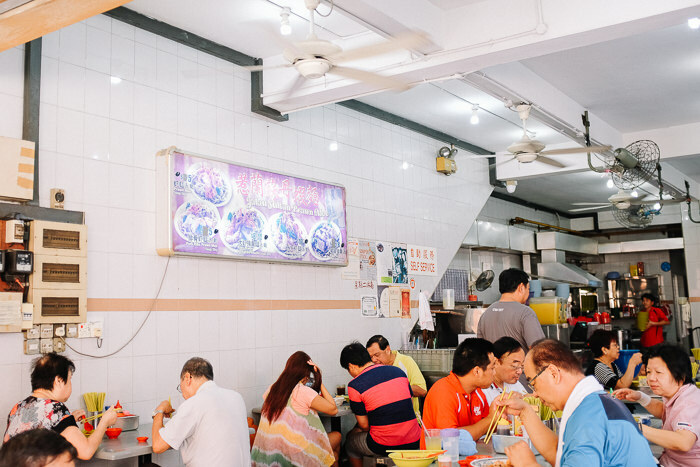 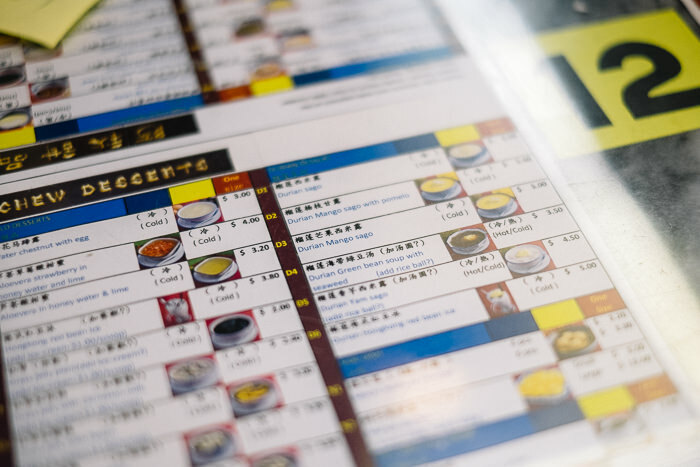 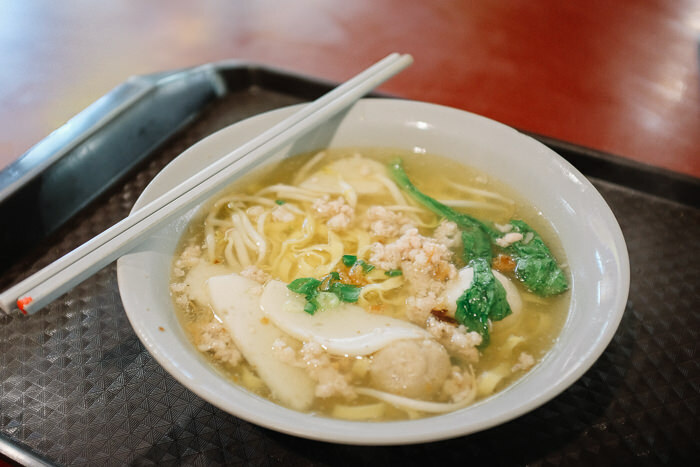 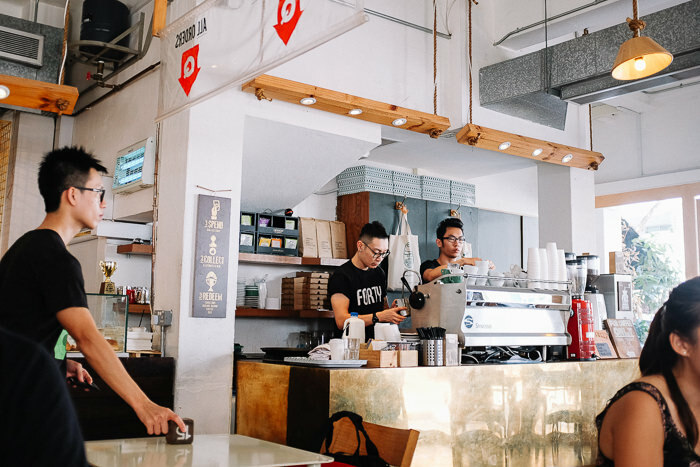 With all the cheap meals you would have in Singapore, Tiong Bahru appears to be an expensive treat but in comparison to prices back home – it ain’t too bad. 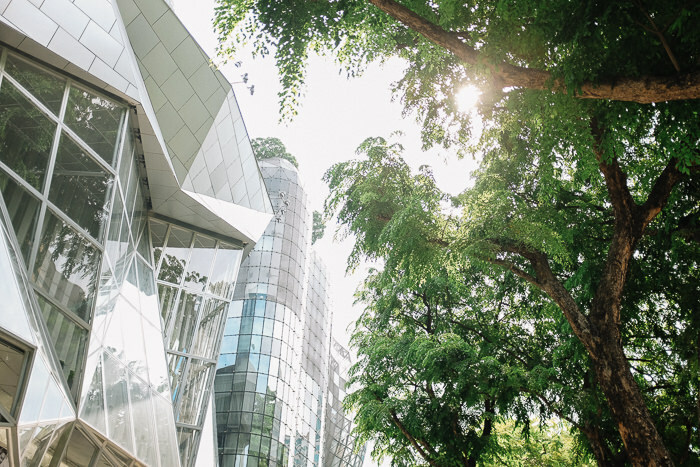 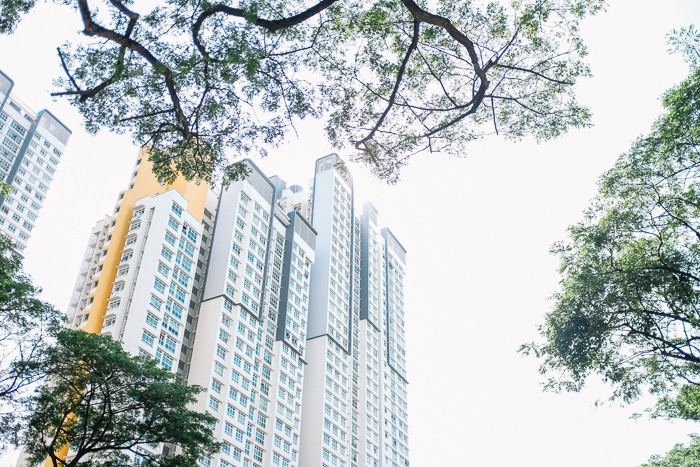 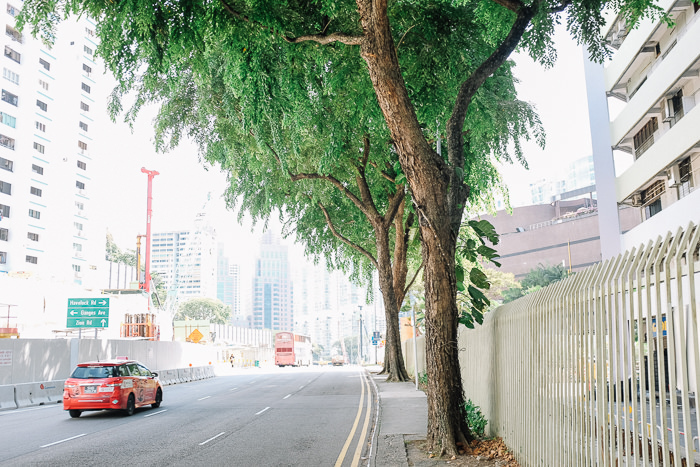 We managed to walk from Tiong Bahru to Ngee Ann City in the Singaporean heat, it was only a 30 or so minute walk and luckily there were occasional tree cover along the way which helped! 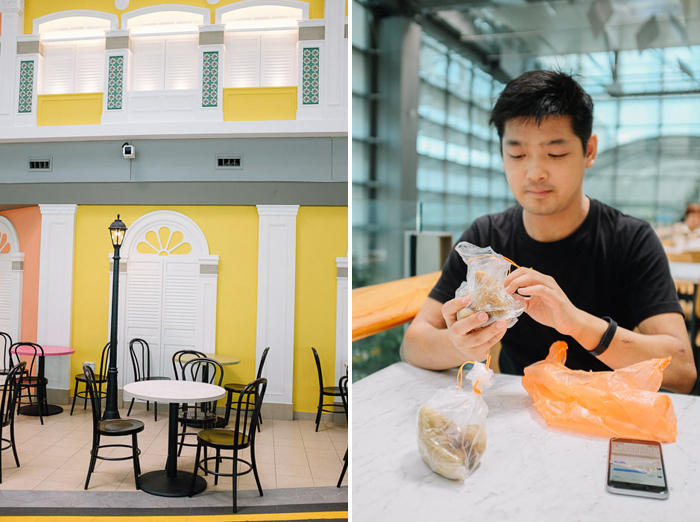 We ducked into Ngee Ann City for a break from the heat, also just to burn a bit of time until our stomaches were ready for the next meal. 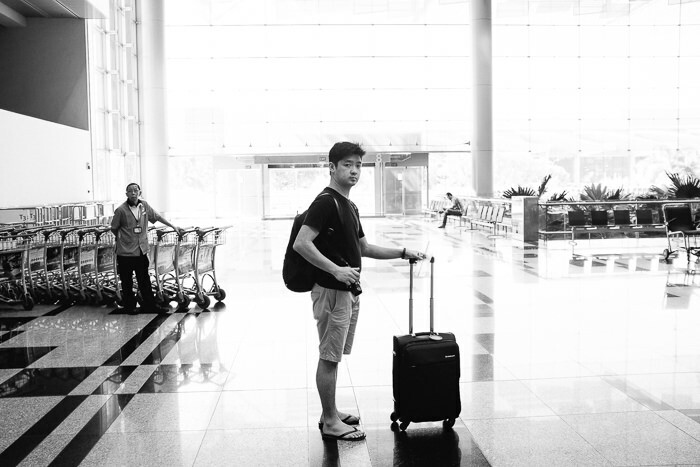 Second time back here! 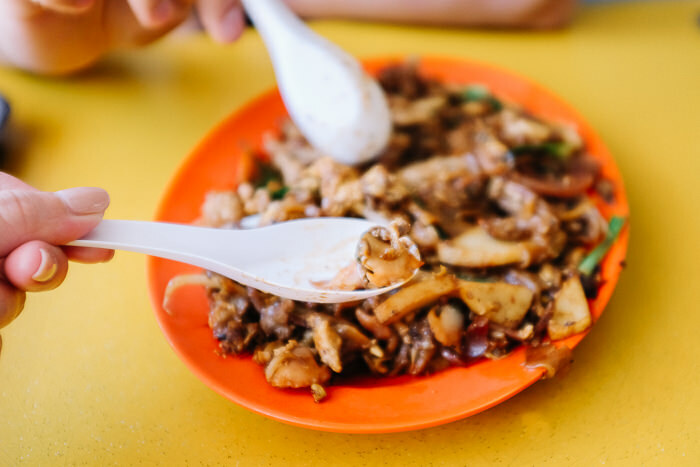 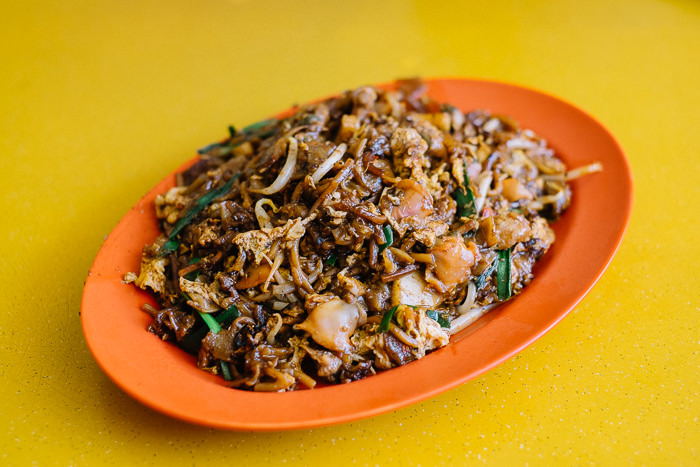 We haven’t tried many char kway teow places in Singapore but this is a local favourite and easily ours too. 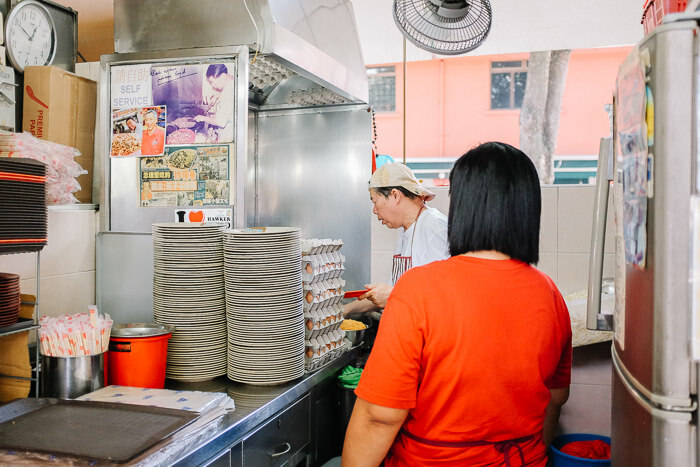 Same uncle cooking up the same CKT – it amazes me how devoted chefs are in Singapore, not getting bored of cooking the same thing over and over again for 10+years! 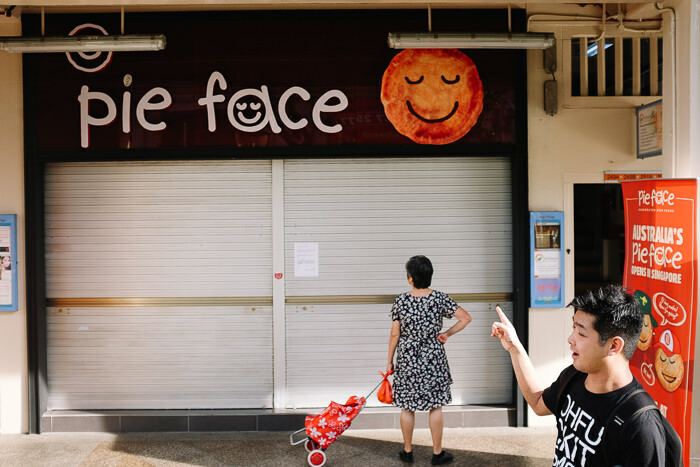 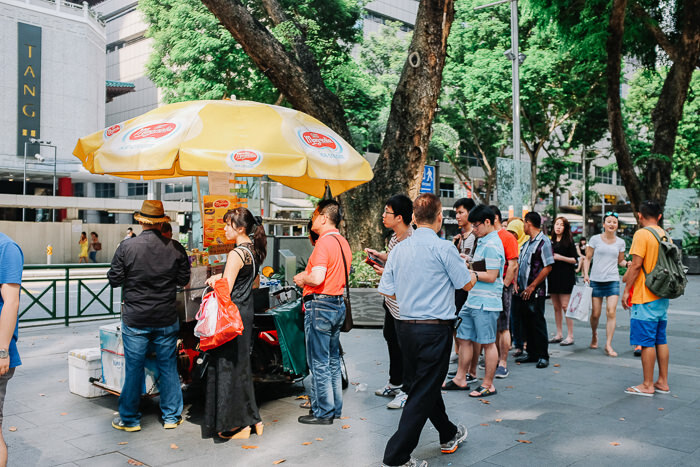 No trip to Singapore can be complete without visiting ice cream sandwich uncle on orchard road! 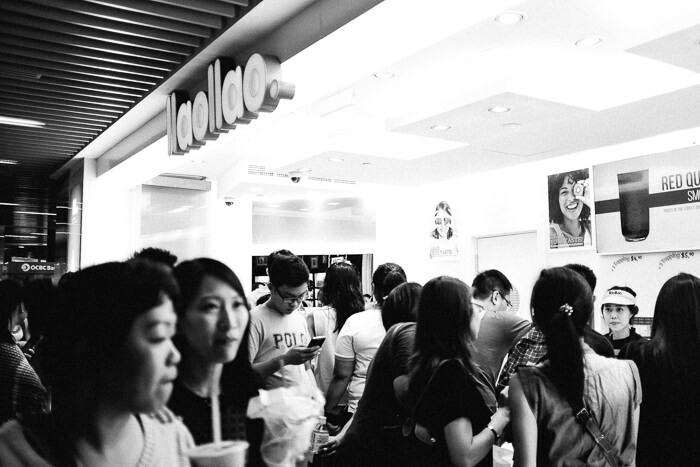 this one had a really long queue so we joined in. 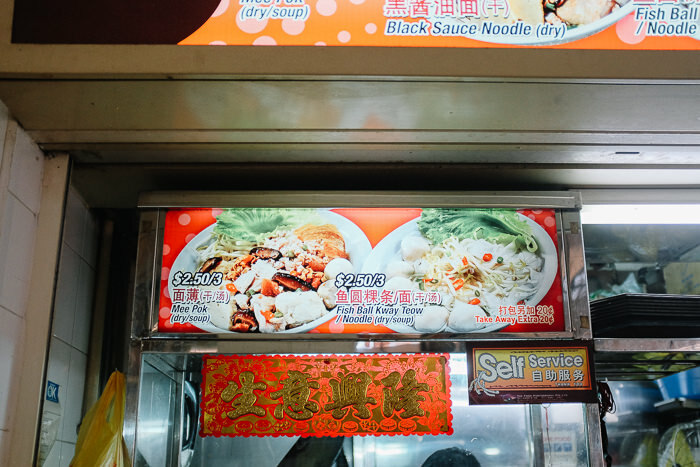 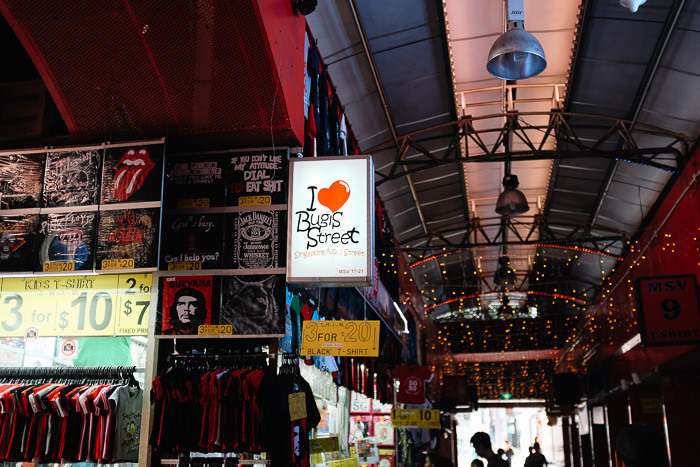 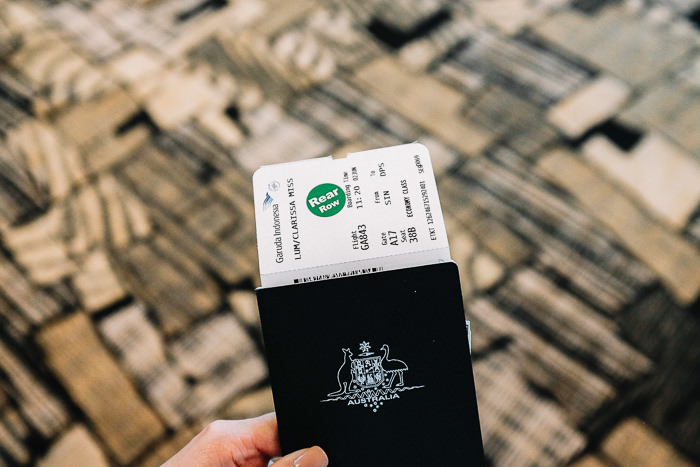 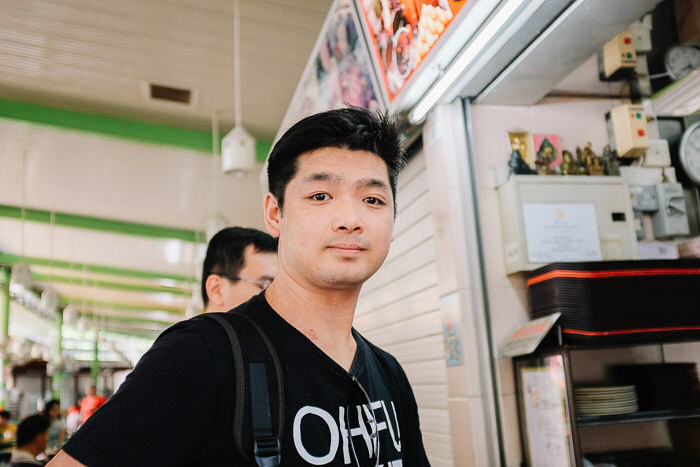 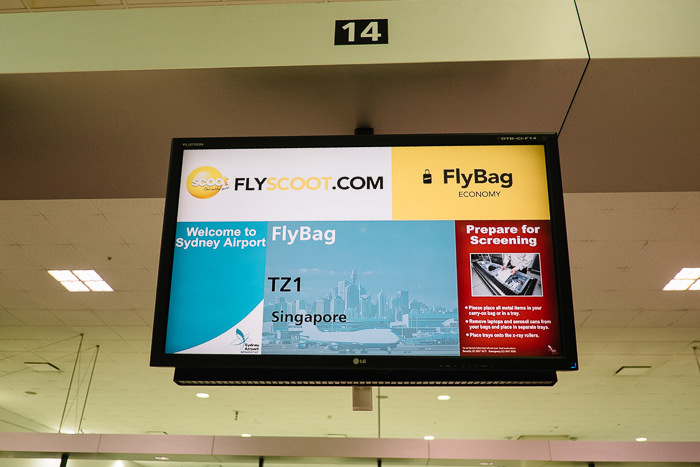 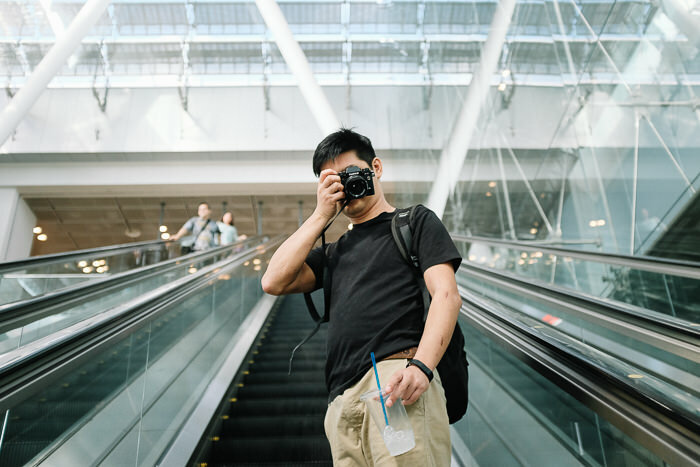 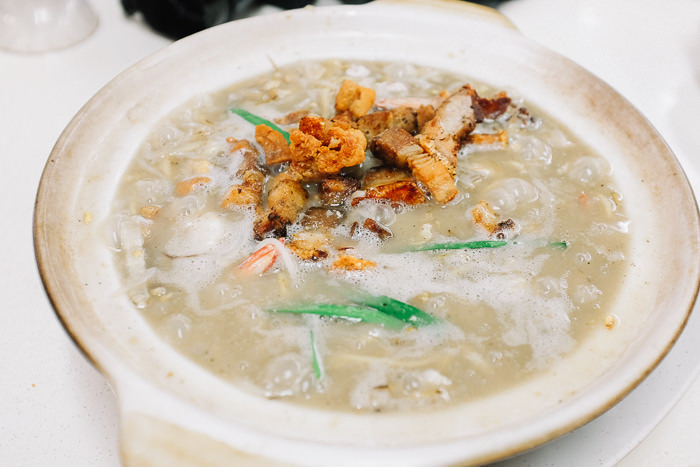 We caught up with more of our Singaporean friends who took us to a new place recommended by our foodie friend who shared photos from this place and we couldn’t help but drool… it was winter in Sydney at the time… and the sight of claypot hokkien noodle is damn enticing. 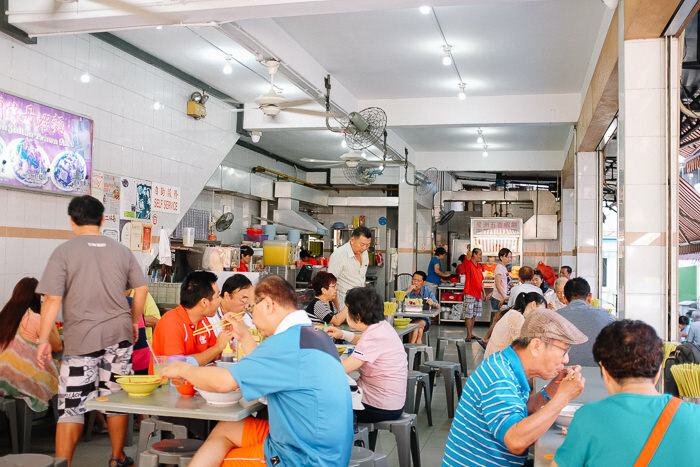 That is exactly what Kim Keat is known for here, you can order different sized claypot depending on number of people. 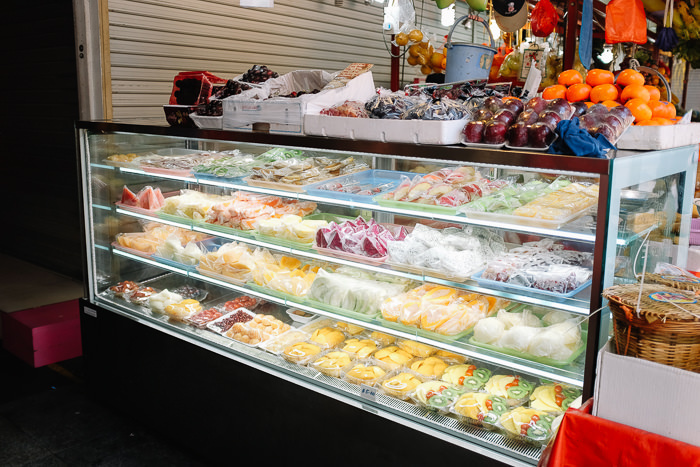 You will find things like pork and variety of seafood. 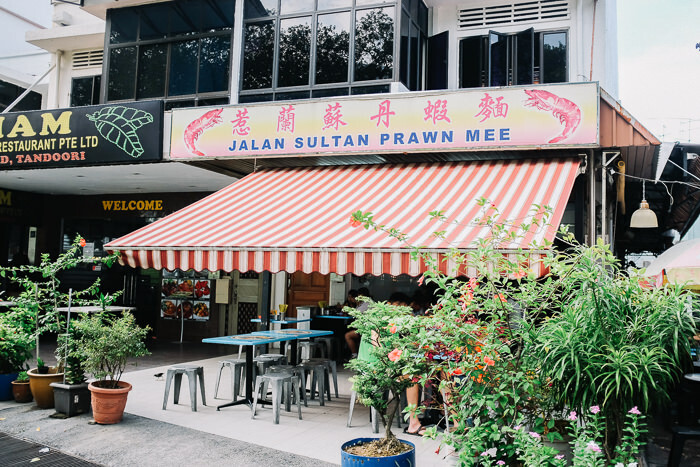 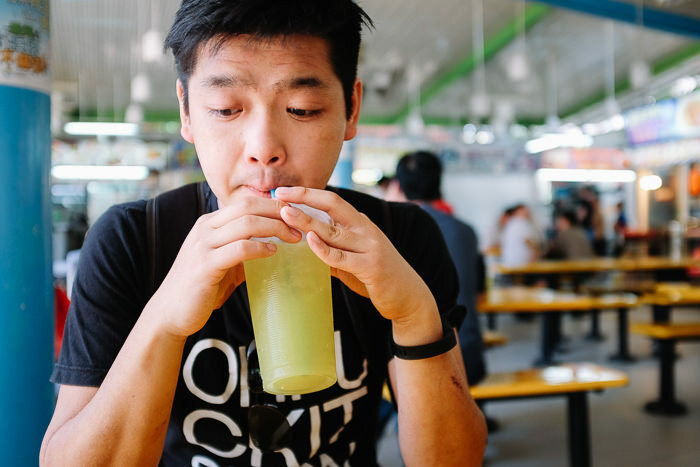 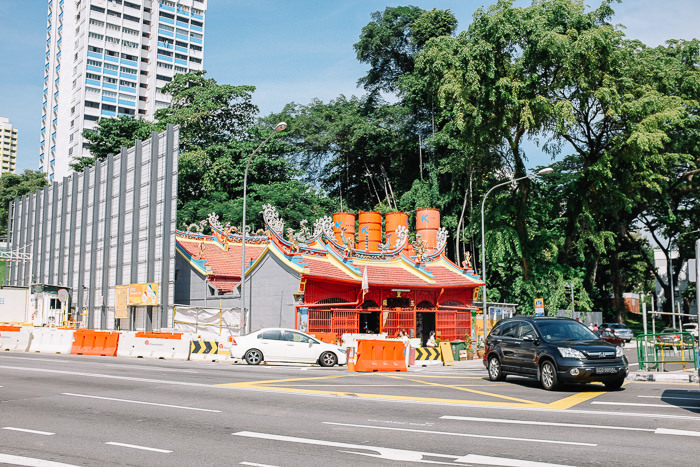 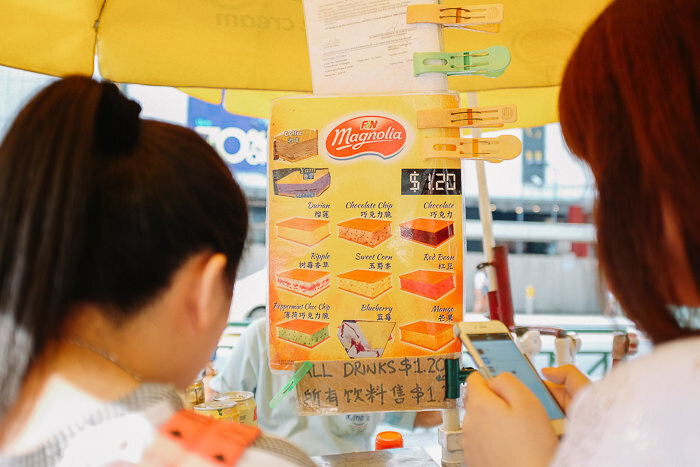 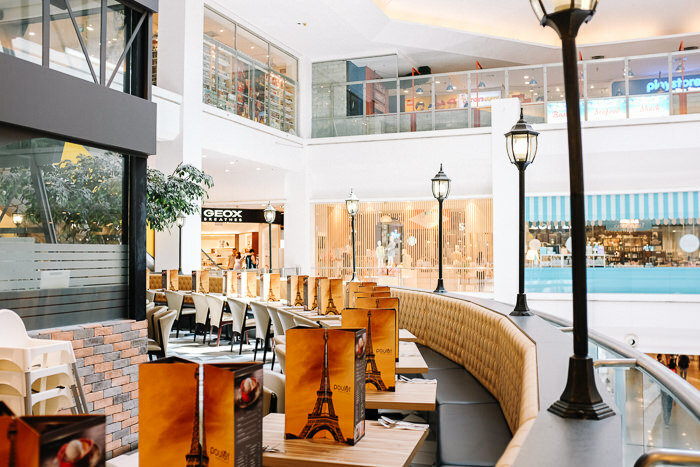 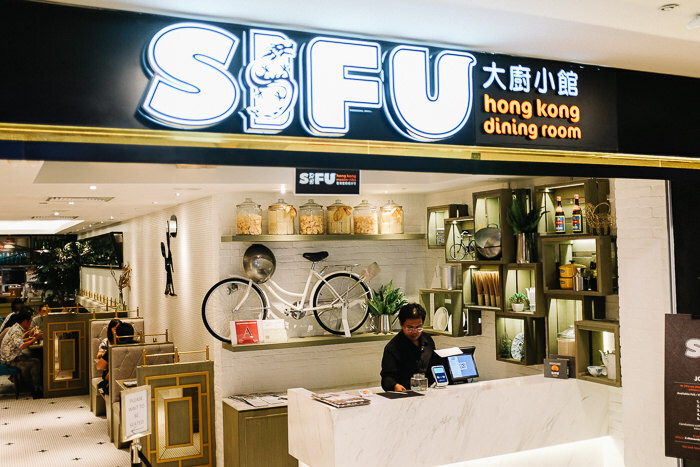 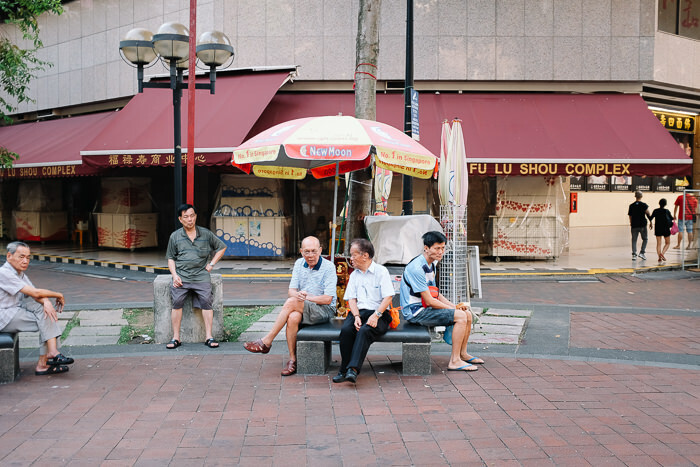 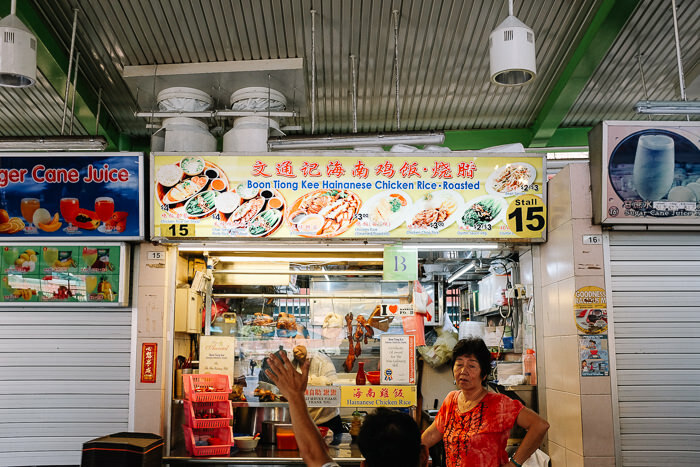 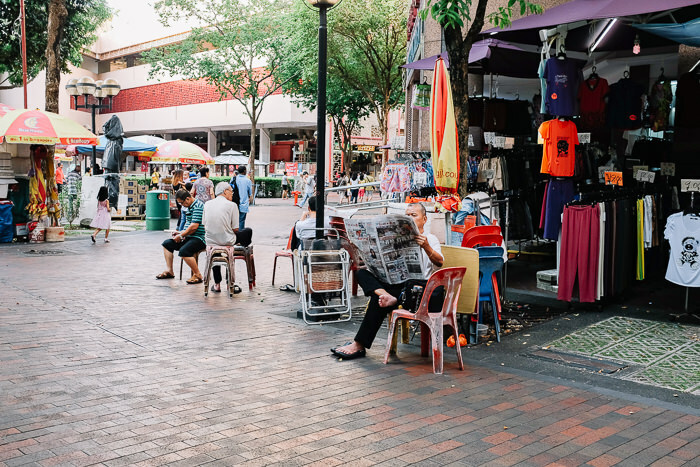 So long as you sit under a fan and order a cold drink, eating hokkien mee out of a claypot is so good – we seriously need this in Sydney during winter! 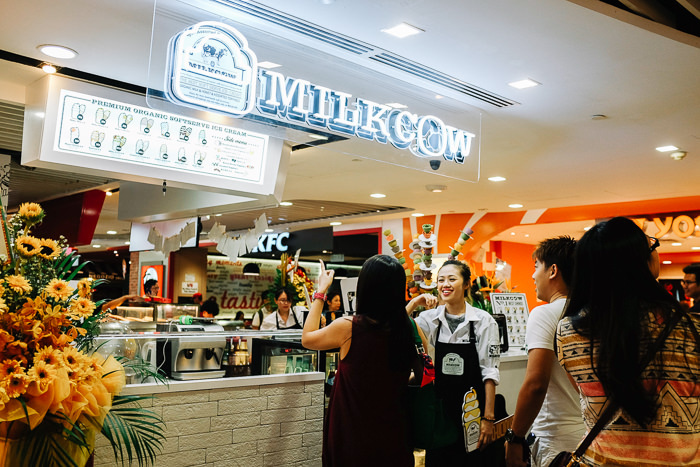 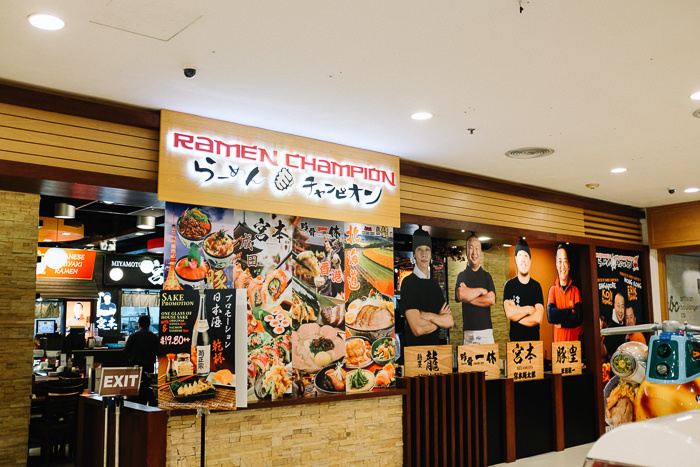 Want to try this place next time in Bugis! 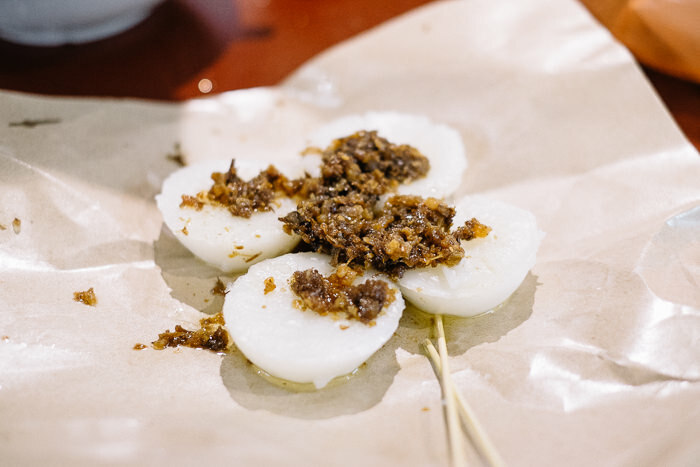 Our friends brought us to another area for dessert, it looked and sounded familiar… then I realise I had seen it on instagram posted by the few Singaporean foodies that I follow. 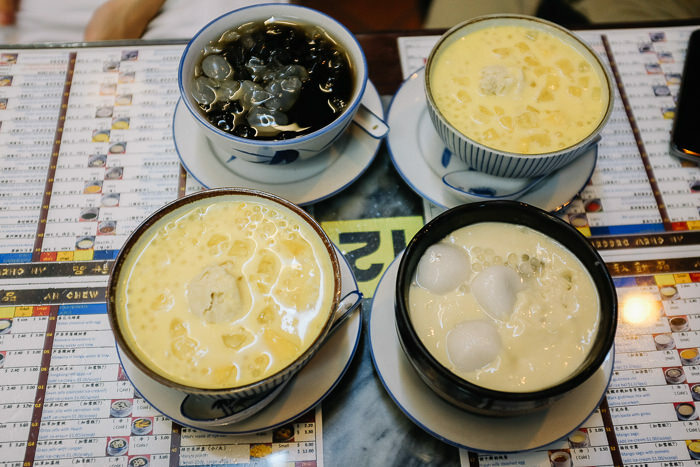 Ah Chew has a good selection of Hong Kong style desserts. 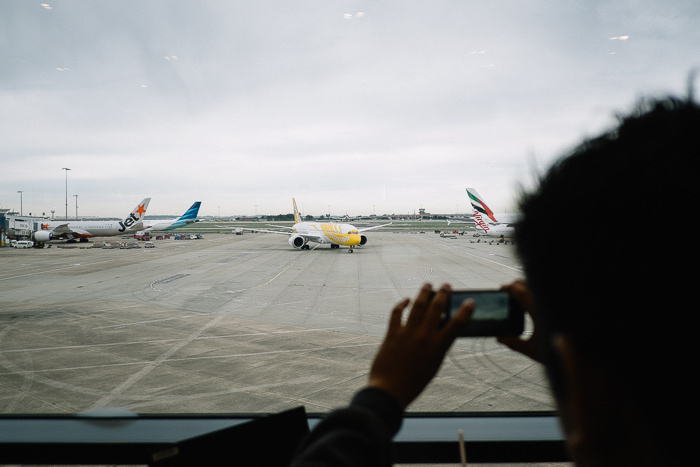 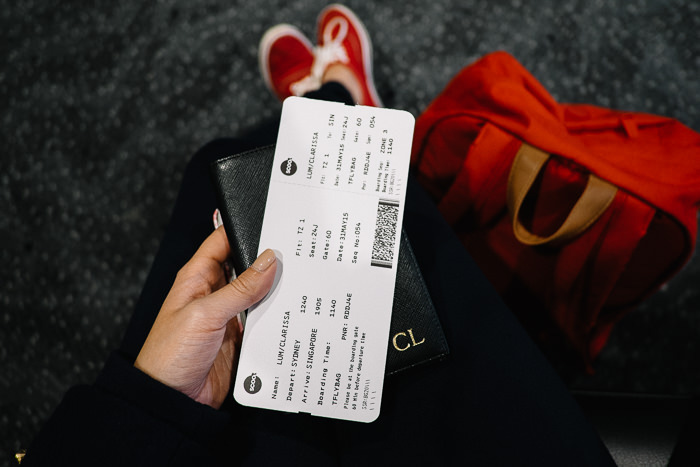 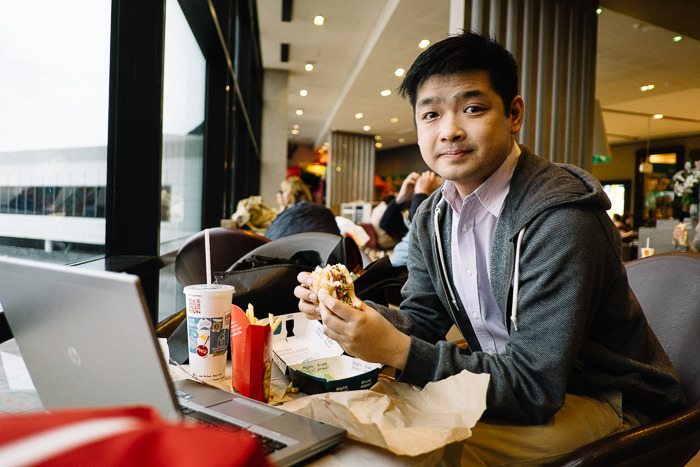 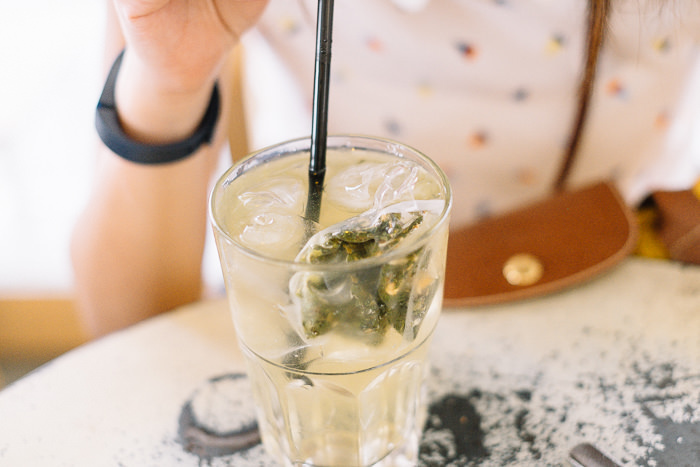 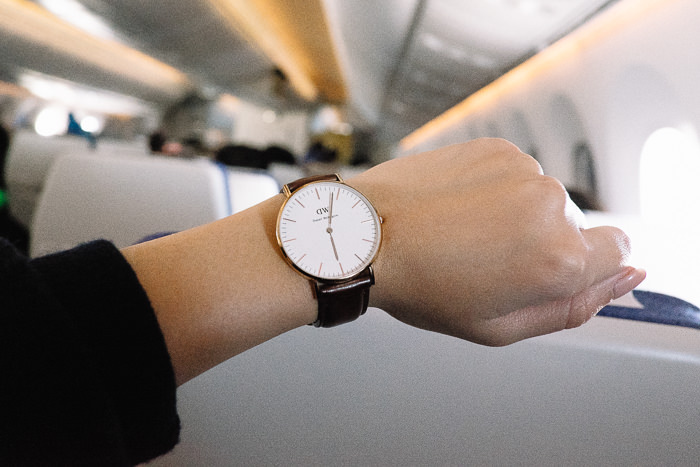 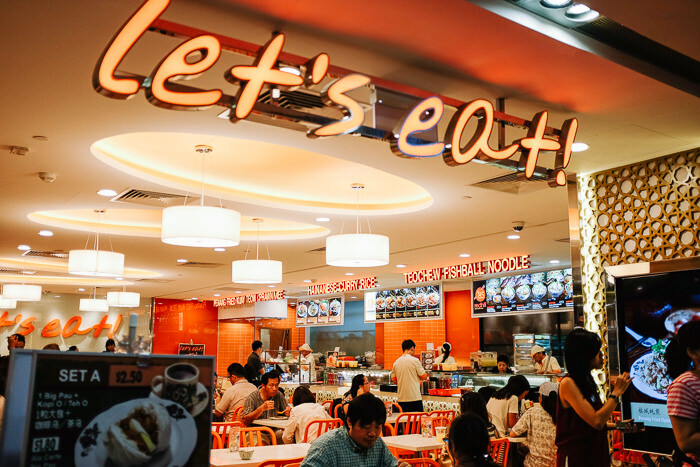 We set out to order things that we crave and we usually return with more than one thing. 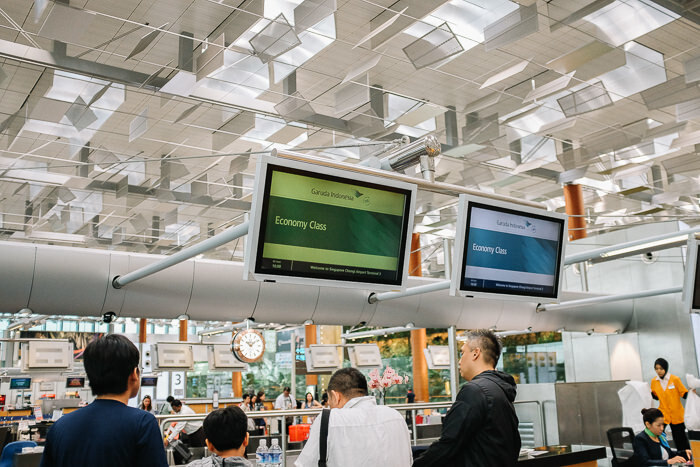 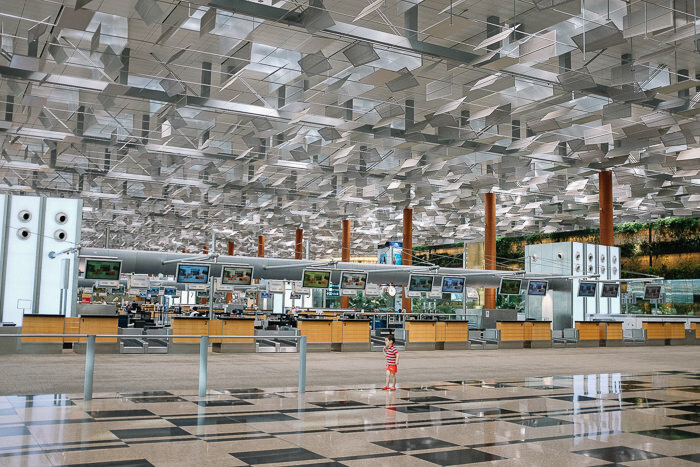 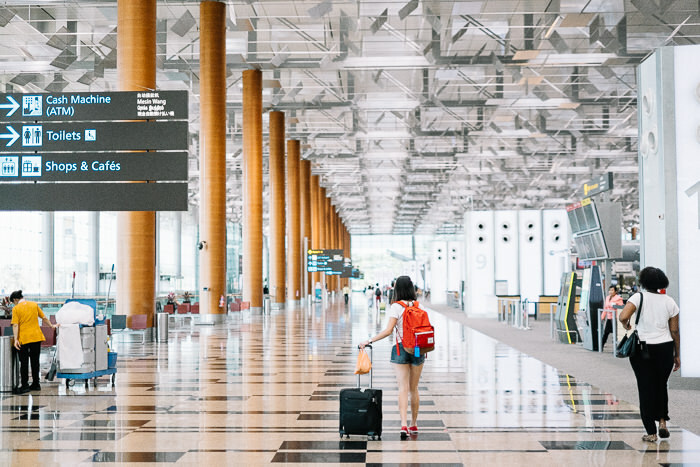 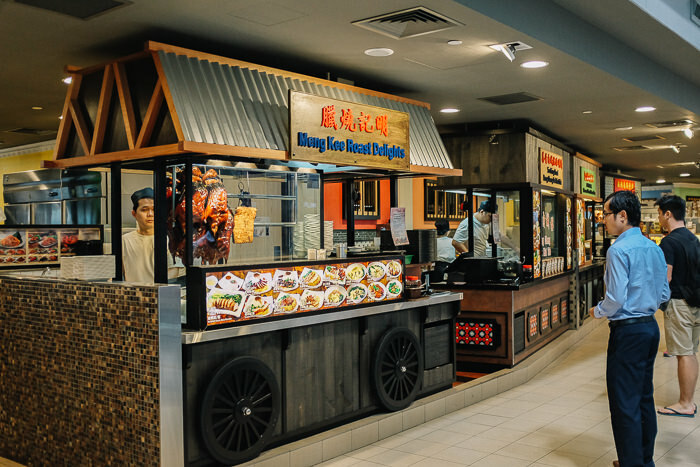 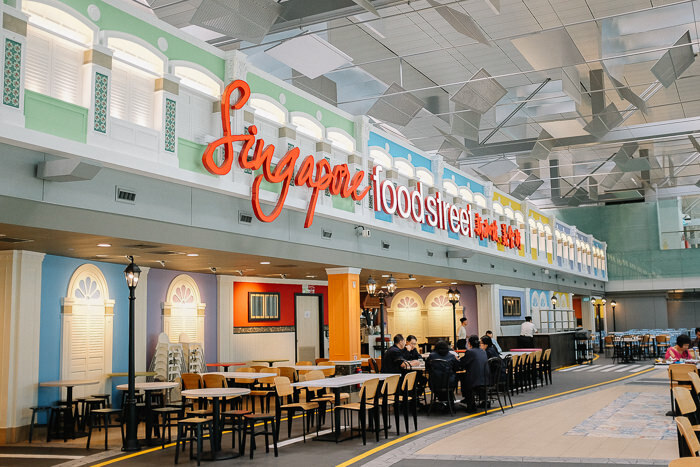 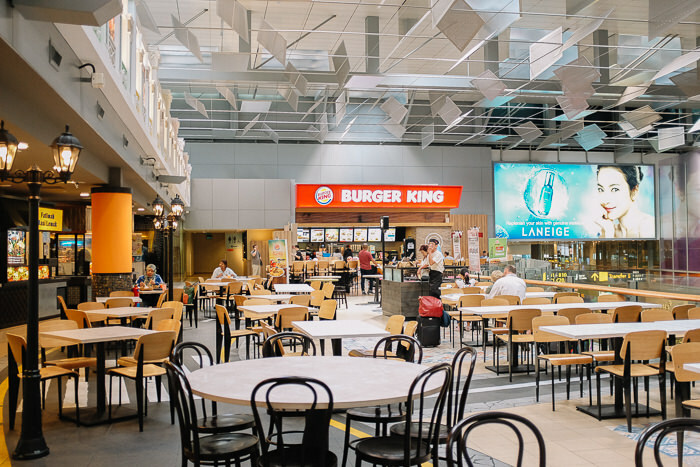 Love the look of the new food court at Changi airport! 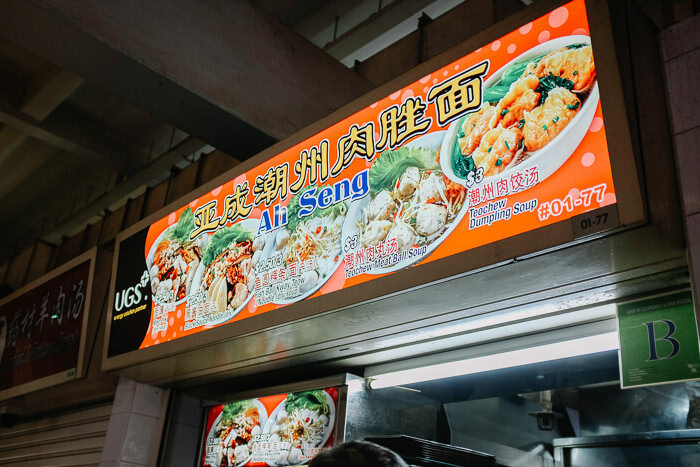 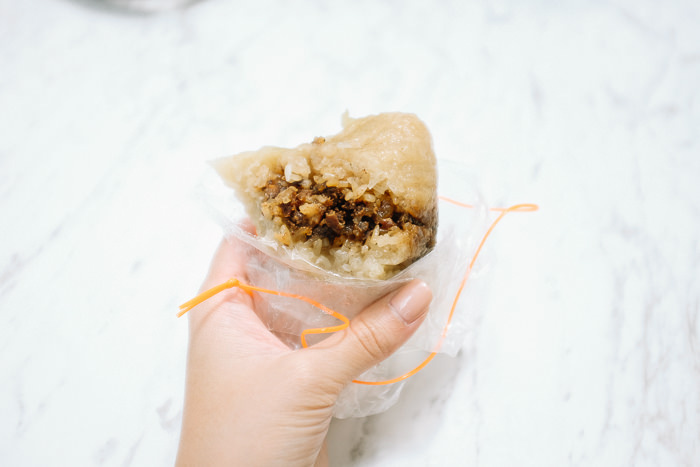 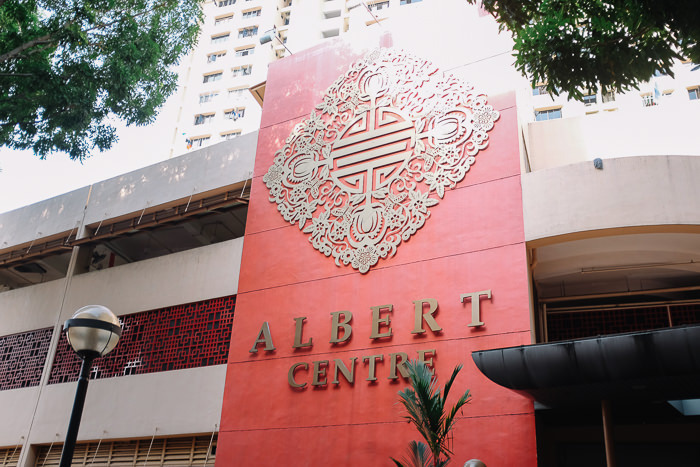 We couldn’t get around to buying nonya dumplings from Kim Choo but luckily we found some at Albert Centre anyway, not bad! 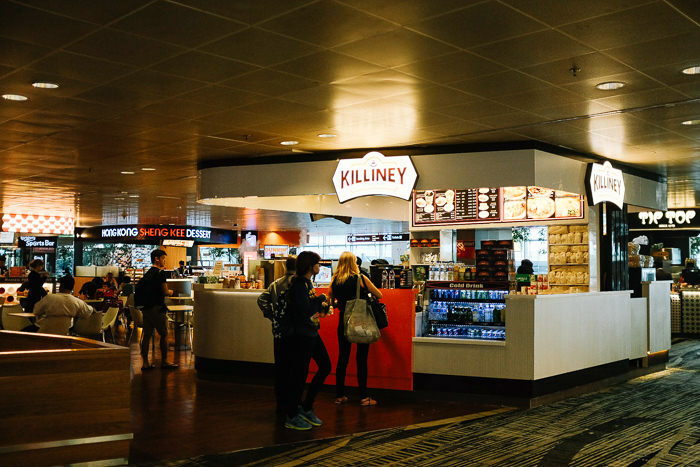 We didn’t go to Killiney this time, luckily they had a branch in the airport, got our kaya toast fix!